It’s 77 degrees and sunny. New York City is having a heat streak. As winter takes an early exit and our premature summer takes center stage, I’m feeling ready to release a few layers. I dispense of my dependable down jacket and store away my series of scarves. I tuck my winter-wear deep into the depths of my narrow New York closet and unearth an enormous amount of sleeveless summertime survival gear. Unfortunately, my comfy winter coat covers nearly half of my hallway hanging space and I come to the conclusion that I need a more sensible scenario. After a quick tap on Target.com and a delivery 2 days later, I find myself on the floor of my 300 square foot apartment contorted and confused as I build a new 36 piece clothes closet that will house my seasonal skirts and summer shirts. Sweating and suffering from 3 hours of Spanish-only assembly instructions with more washers and wooden dowels than I care to mention, I place the final fixture atop my 6 foot 5 inch creation and hope that my 3 years of Ms. Crecca’s high school language lessons have served me well. I gained a brand new closet to store my seasonal stock but depleted my recources and exhausted my energies in the process. And not one of the alcoholic variety but rather, one of those sweet syrupy refreshments that symbolizes that summertime is about to bloom out of this springtime of indecisiveness. 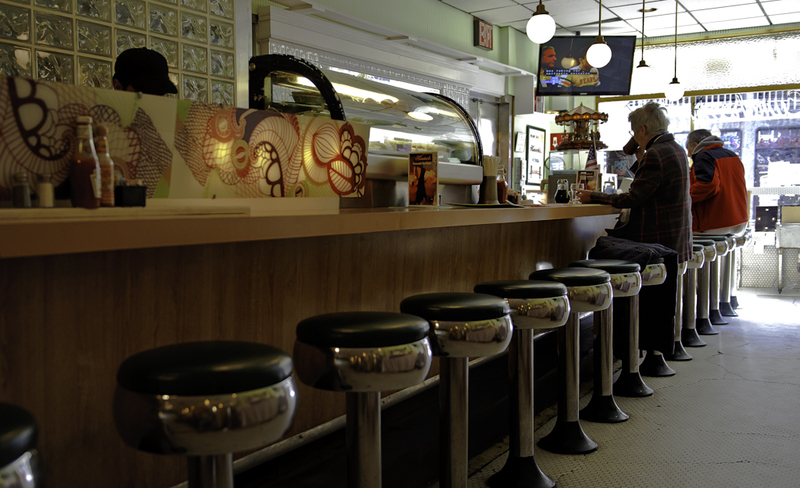 I quenched my thirst last Thursday making Egg Creams at Hinsch’s Luncheonette in Bay Ridge, Brooklyn. I wake at 7AM with only one item on my agenda: To craft the quintessential Brooklyn Egg Cream. My only obstacle is the R train. After 2 unexplained train delays and 22 sessions of “please stand clear of the closing doors” I arrive in the Borough of Brooklyn for my morning shift. 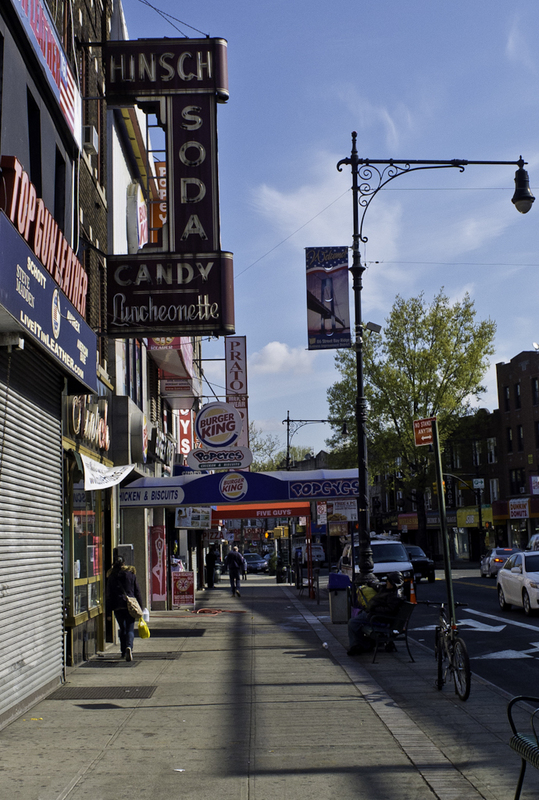 I was raised hearing histories of a Brooklyn of an ancient era. My parents painted a picture so pure and peaceful that I sometimes wish the subway was a modern day time machine. I wish that when I emerge above ground on the other side of the East River that I will arrive in a Brooklyn filled with stoop ball and Spaldeens and sock hops and sweet confections sold for 5 cents at the corner store. 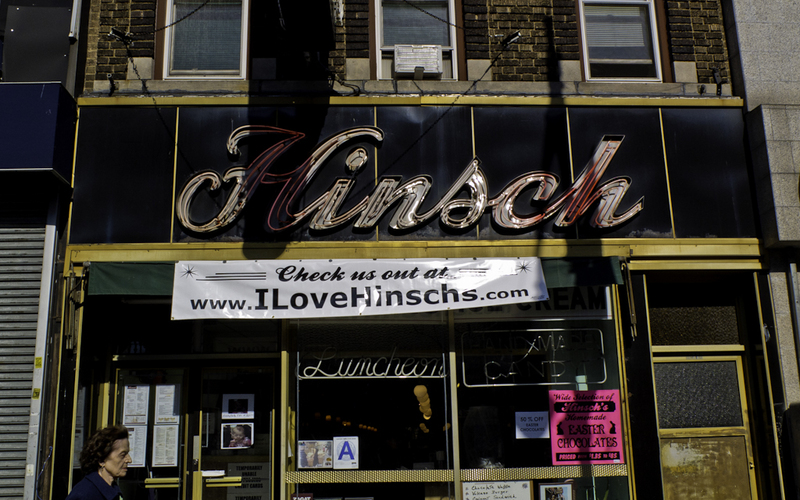 As I arrive at at 8518 5th Avenue and spot the old-school style sign for Hinsch’s Luncheonette that stands out among a sea of modern meal monopolies, I begin to wonder if all my wishing has been rewarded. I’m about to enter one of the few old-time luncheonettes that have been lost on our recent city landscape. This one is complete with its own confectionary. 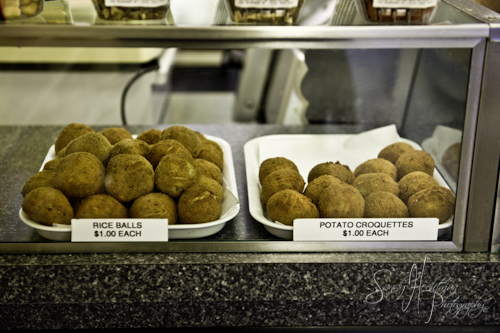 Yes, they even make their own malted milk balls and nonpareils and the best-I’ve-ever-eaten-butter-crunch in small batches off site and sell it here at Hinsch’s. I’ll have to save some of those for later. What I’m most in need of is a good old fashioned egg cream. But I’ve got to begin with the rites and rituals of this carbonated concoction before I can quench my thirst. As I enter the 1890’s building the series of forrest green bar stools beckon me back in time. 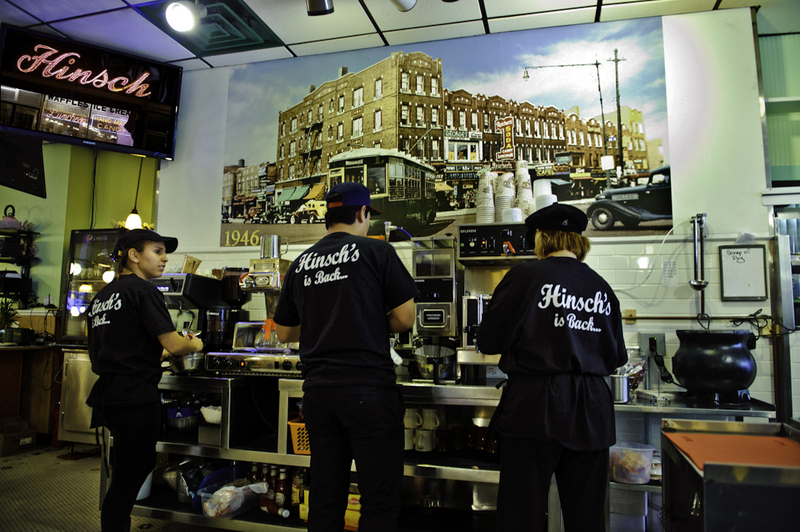 The wallpaper patterned plastic booths invite 3 scoops and 2 spoons to savor Hinsch’s homemade ice cream. But I’ve got labor longer before I enjoy her rewards. 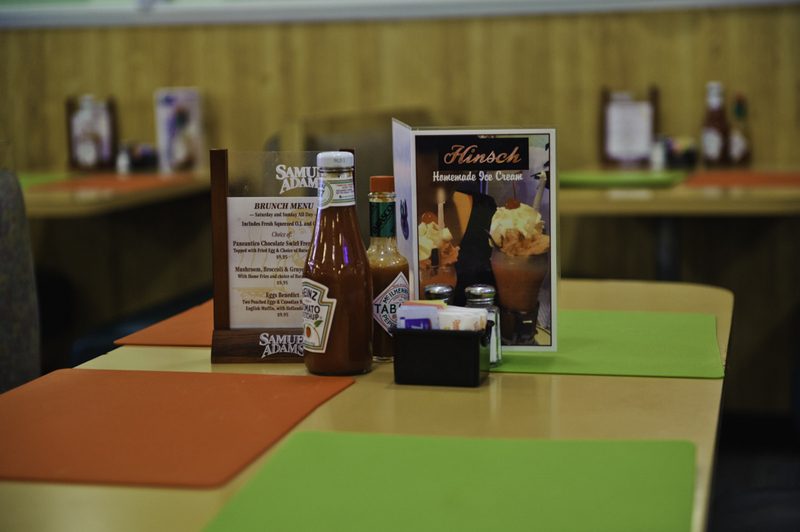 At Hinsch’s, as delicious as the dinners are… it’s all about the drink. I meet Raul, the ice cream professional who schools me on the subtleties of egg cream creation. 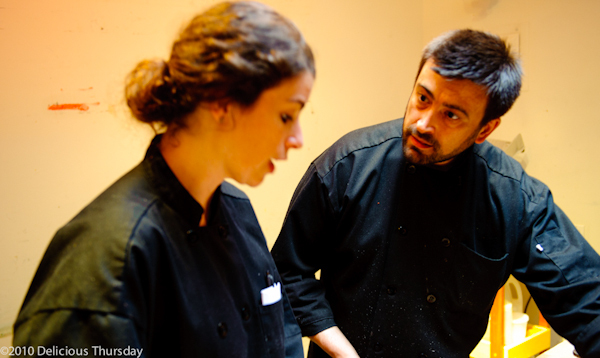 With a passion for perfection, Raul instructs me on the proper proportions and the ideal order of ingredients. Raul corrects my mistakes as I make them – and there are many. 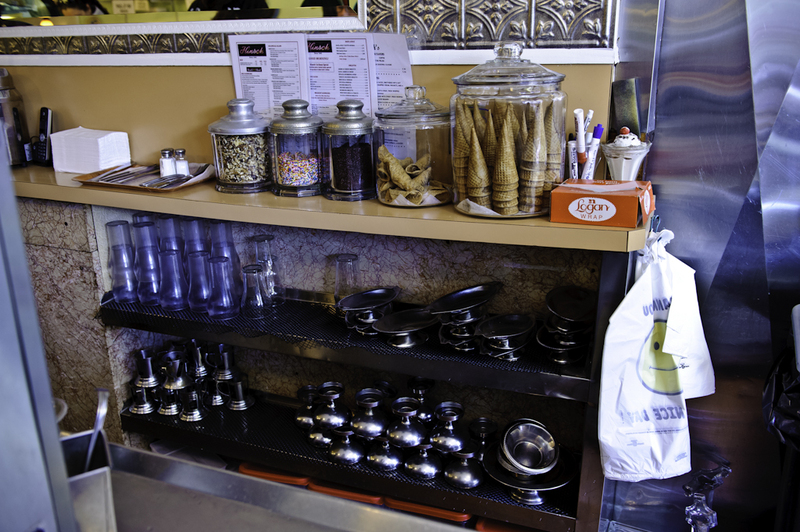 The egg cream is an art form created at the fountain and focusing on 3 specific items: milk, seltzer and Fox’s u-bet brand chocolate syrup – in that order and with specific measurements. I reach for the proper vessel but am overwhelmed by the shelf lined with banana split bowls and antique sundae dishes. Raul guides me to the classic coca cola glass and places it on the countertop. My tentative pours lead to much less milk than my recipe requires and my stirring ability lacks speed. The signature frothy foam atop my egg cream is in danger of losing its bright white color as I drizzle a dab of chocolate syrup in the wrong direction. 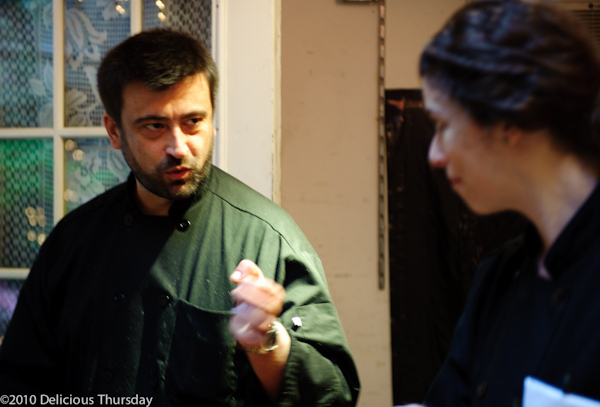 Raul coaches me a few more times before I make an egg cream worthy of the next customer that wanders in. I’ve never met a drink so ritualized and revered and with so many obstacles to perfection. My own Father often schooled me on the secrets of a excellent egg cream. His every-other-evening treat was an exercise in potions and portions. He offered me ingredients and insight as he spoke standing at his perch at our kitchen countertop and instructed in such a stoic manner as to signify the ultimate importance of: Milk, then seltzer, then syrup, then a speedy swirl of the spoon. And even today, with Raul watching my every move and with my father’s voice echoing in my ears, the excellent egg cream eludes me. Even the name egg cream is crowded in confusion and marred with mistakes. There’s no egg. There’s no cream. And mysteries surrounding the moniker abound. One story suggests that the use of grade ‘A’ milk lead to the name: “A” cream, which sounds suspiciously similar to ‘egg’ cream. Another theory attests that ‘egg’ is a corruption of the German word echt (meaning genuine or real) and that this drink was indeed an echt cream. Another argument in this unending debate travels all the way from Paris, France where the ‘chocolat et crème’ (chocolate and cream) morphed phonetically into our beloved Brooklyn beverage. A final sentiment on the subject suspects that the first version did, in fact, use egg and cream, but that those ingredients were eliminated due to food restrictions during WWII. And even though my cocktail technique may fall short of perfection, Raul appears impressed with my egg cream understanding. All this egg cream investigation has me thinking about a few labels of my own. I wondered about the words we so regularly whisper but seldom scrutinize. Our cast of characters is filled with lovers and enemies, friends and foes – all playing overlapping roles. And what about the word family? How do we define a word that is littered throughout our lives so frequently, that it often escapes explanation. I have an adorable uncle named Stanley who, by definitions sake, is not really my Uncle. Many years ago my Dear Uncle H passed away. My Aunt met a nice man at a meeting and although they’ve never married, Stanley is more my uncle than many others, though there is no bloodline between us. 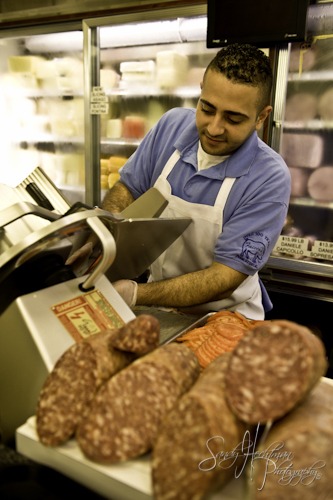 And from my vantage point, whenever I stand on my Cornelia Street stoop and look lovingly all around, I see my extended family: I have 15 blue shirted brothers who work behind the counter at Faicco’s at the beginning of our block. I have a best friend who also happens to be my boss. We all share one beautiful black coated canine named Charlie who resides at 29 Cornelia. 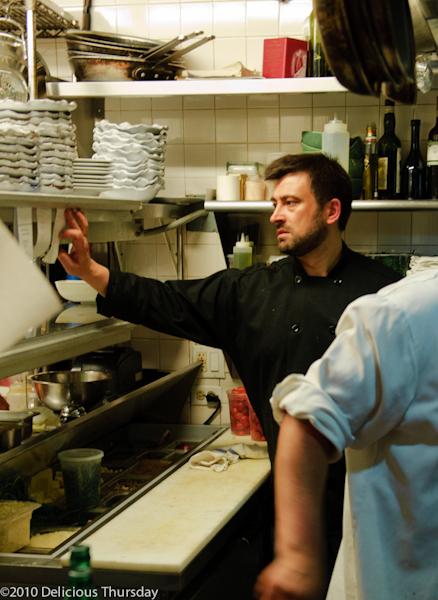 And lastly, I have a husband at Home Restaurant and although he may not exactly fit the origins of the word (from the Old Norse meaning Master of the House) he serves as more of a husband than others who have held his position. 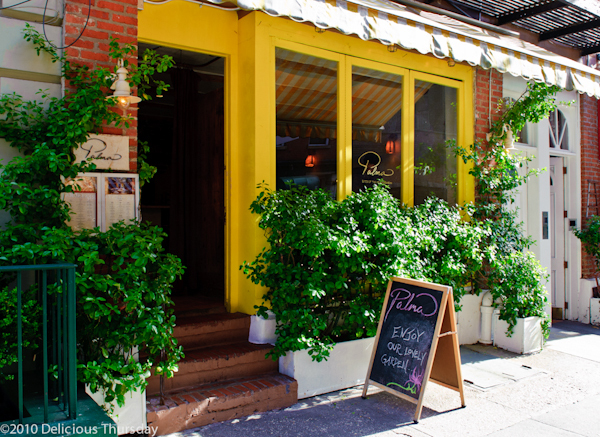 Although none of them know this is their namesake, our Greenwich Village Family – while not ancestors, nor blood, nor brood – share a Cornelia Street kinship that is apparent to anyone who is willing to extend their dictionary definitions. As I think about my new friends back at Hinsch’s, I am starting to see some of these very same characteristics. There is a difference between dining in a restaurant and being adopted into family. And Hinsch’s has perfected the latter with its proud papa and protective patriarch: Roger Desmond at the helm. Roger is the type of owner who offers hellos, handshakes and ‘how ya doings’ to each and every one that enters. Hinsch’s is not an exclusive club. One needs no engraved invitation. There are no formalities, no fancy furnishings or tables topped in white. No velvet ropes to wrestle with and no reservations required. This is a flock of friends who have formed into family. Just one order of their well known waffles and you’ll feel the same. But this family – Hinsch’s happy family, like so many other families – is marred with mourning and near misses. 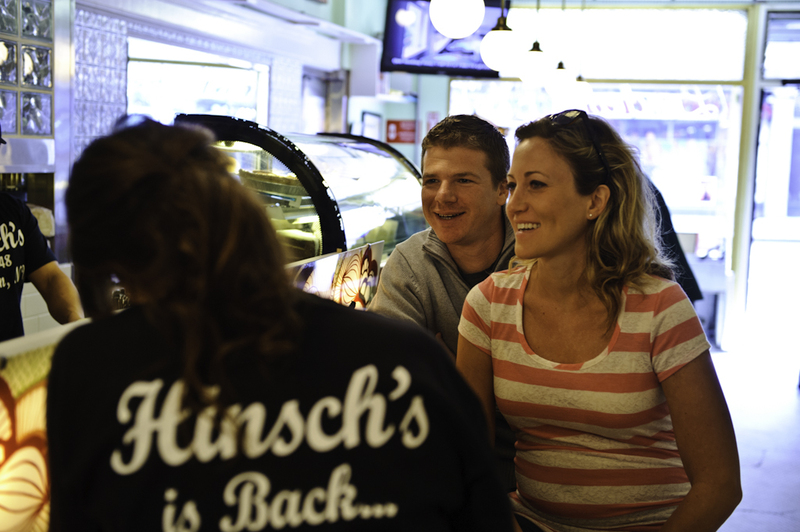 After 6 generations of family-run fun and countless egg cream creations – Hinsch’s was going to be history. 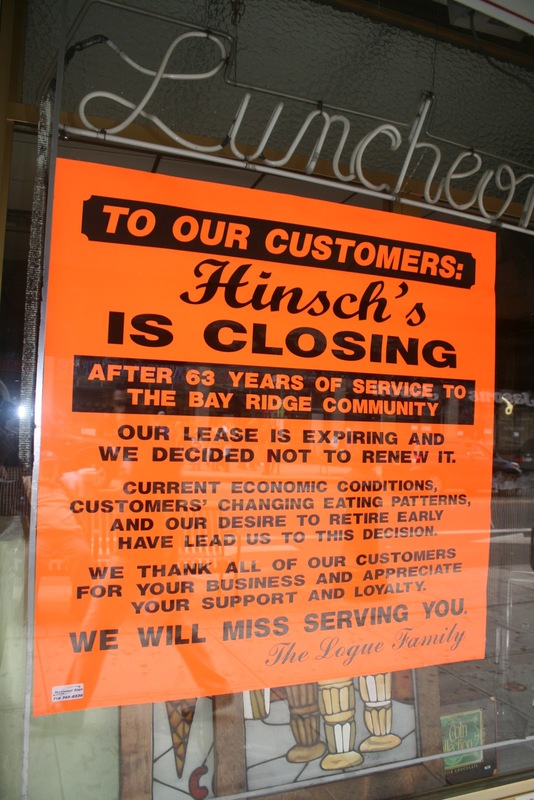 On September 29, 2011 a sign in the front window read: HINSCH’S IS CLOSING AFTER 63 YEARS OF SERVICE. It struck me that, in NYC and beyond, you never know what you’re walking by until it’s gone. 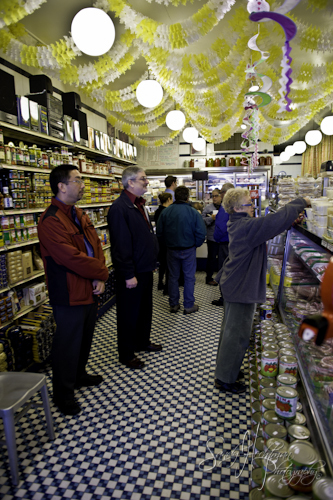 Well loved shops with long histories fall by the wayside, just as my Grandfather’s did. And Hinsch’s was about to suffer the very same fate. 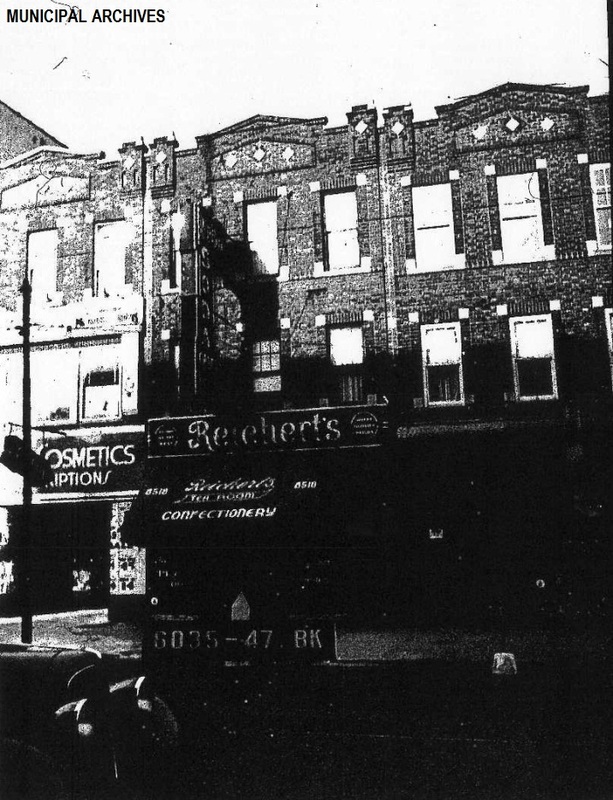 Hinsch’s originally opened in 1915 as Reichert’s Ice Cream Parlor before Herman Hinsch took over the business back in 1948. 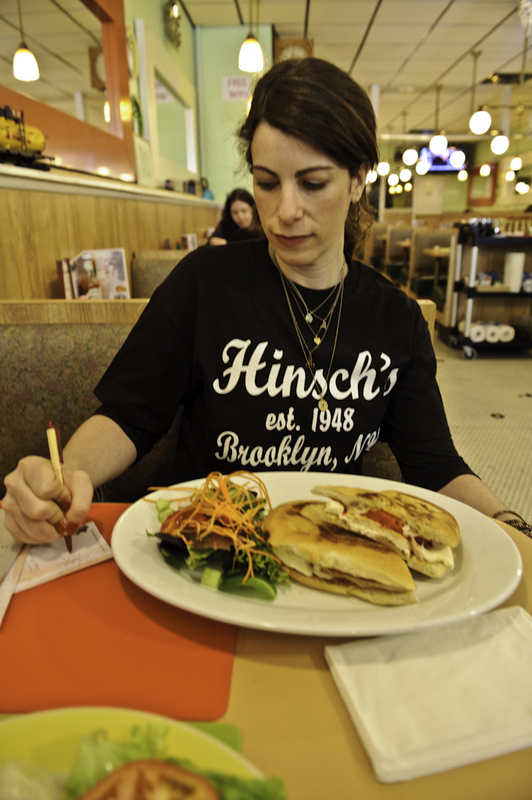 Hinsch eventually sold, in 1962, to the Logue Family who carried on the namesake – along with handmade chocolates and hand packed ice cream – until the current economic crisis, rising rent and desire to retire threatened this beloved brooklyn eatery. Hinsch’s went the way that so many Happy Days era diners do. They were done for. When the doors shut on that dark day, this story might have ended sharply. The headlines were headed to print (and printed) and the locals forced to find another hangout to call home. 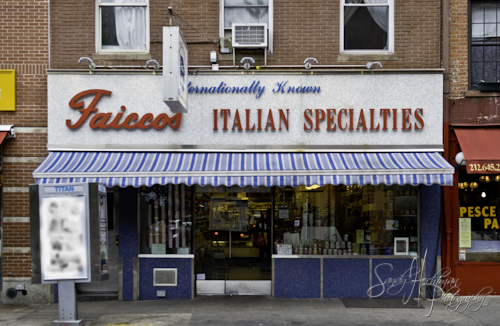 Another New York institution loses its life. But Hinsch’s fate followed a less predictable path. 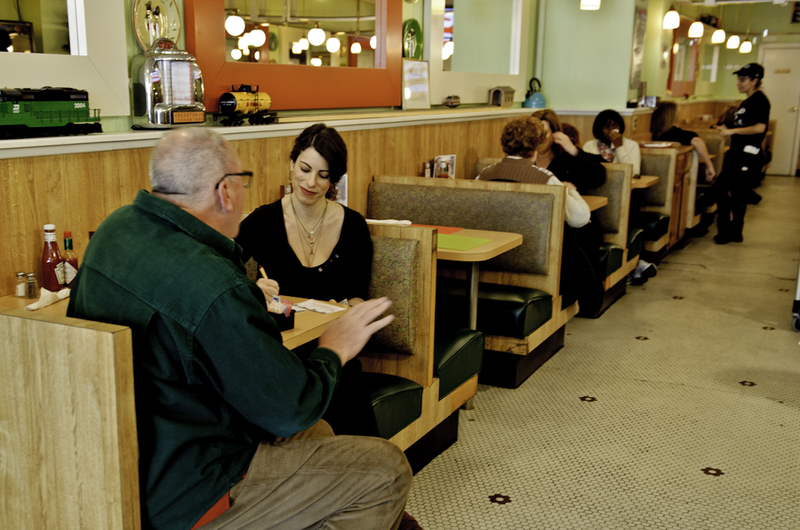 She’s the little luncheonette that could. Enter Roger Desmond: Local business owner. Neighborhood guy. Hero. 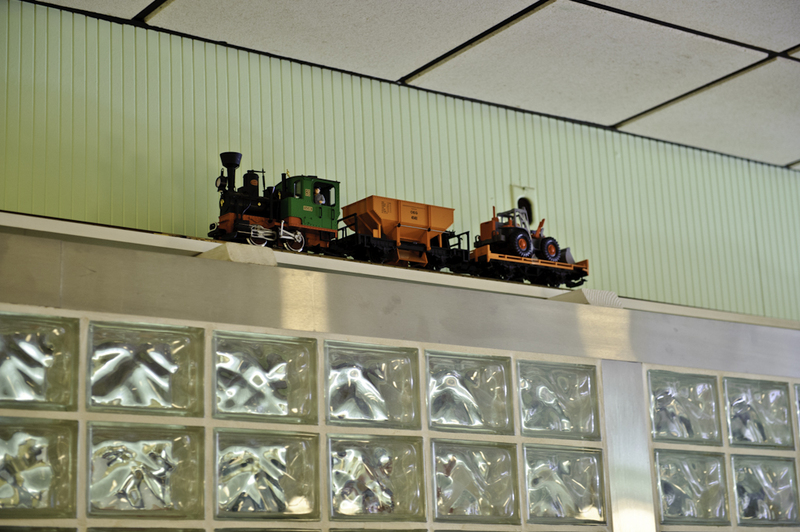 When the nostalgia nestled in Roger was inspired, then inquired and eventually acquired Hinsch’s. He remembered the Hinsch’s of his youth – he’d stop in after school whenever he was in the mood for a good old grilled cheese & some neighborhood girls. His heroism is not completely lost on him. As humble as he is, Roger does get a kick out of his newfound status. “I own Hinsch’s, for gosh sakes.” It’s a bit of a self esteem boost for him. 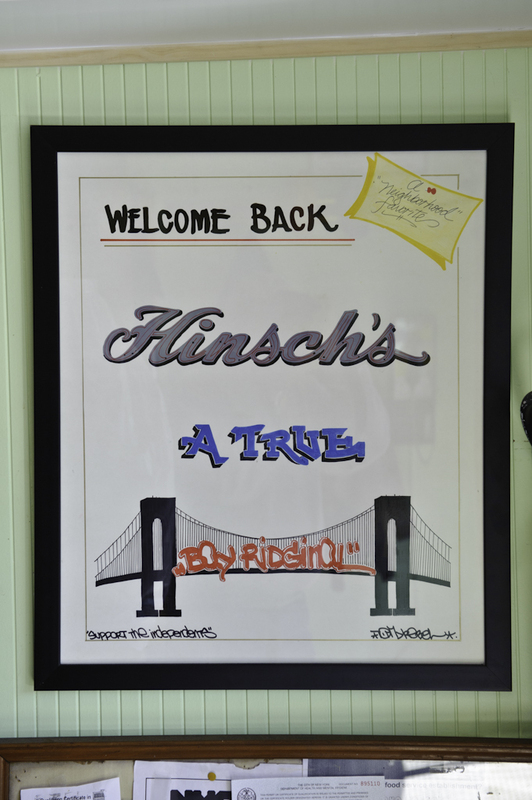 “If you can make Hinsch’s come back, thats nice.” There’s something sweet and simple about the sentiment. 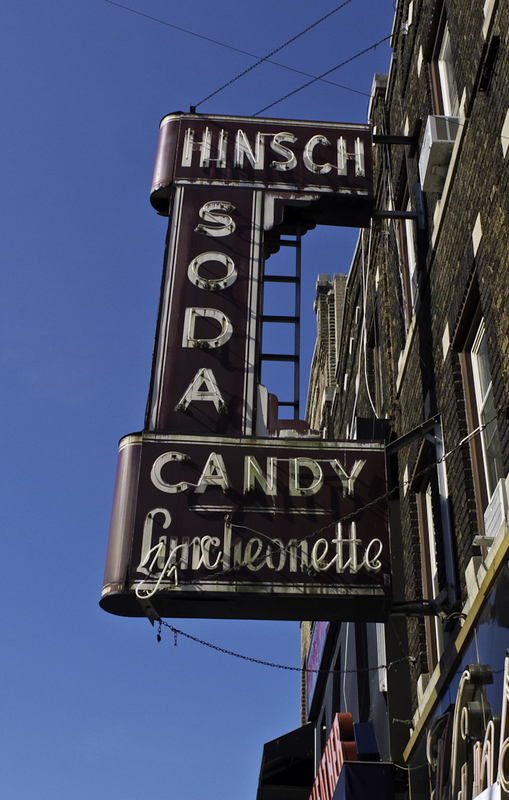 But after all, there’s something sweet and simple about Hinsch’s too. And after 2 months of renovations, the doors eventually opened again. 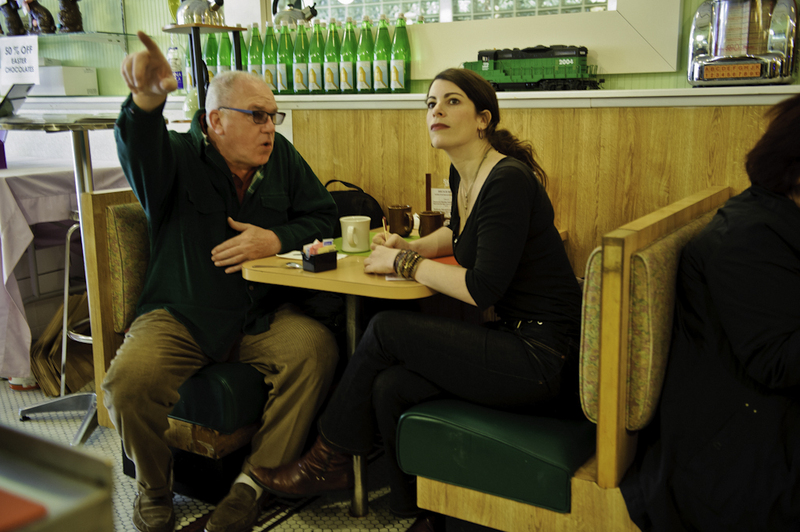 Long live the luncheonette. And even if you’re not yet a regular, wait a little while – you surely will be soon. And so Hinsch’s was saved – as the backside of the staff shirts proudly proclaim. Brought back from the brink and rescued from a harsh reality – as so many of us have. I, too, remember a time when I was feeling quite lost myself. And my savior? The city itself. To her, I am forever indebted. I recall a time in late August of 1998 when I wandered jobless and joyless just after grad school graduation. I moved from my small Hamptons hometown to live in the corner of a cousin’s kitchen on 77th and Columbus. I knew nearly no one except for the next-door neighbor I dated for a short time, only to discover he was also dating his next-door neighbor – one wall away from me. I’d listen at the door for the sounds of his arrival and often sat in silence when he wouldn’t return for a while. I figured it was time to find another friend so I turned to New York and asked for her assistance. She became my constant companion. I devoured her sights and sounds, block by block. 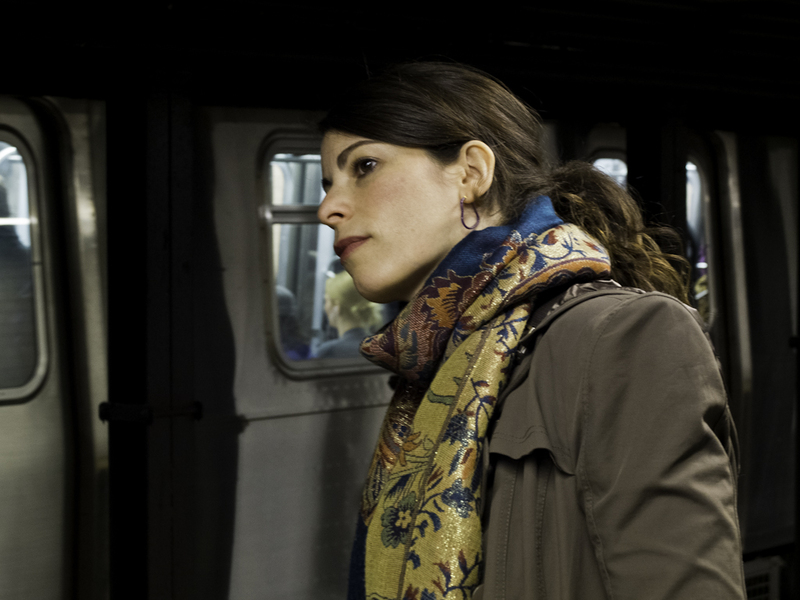 I rarely took her subways but preferred a more intimate approach. I pounded the pavement and after 3 miles to work and 3 miles back, a best friendship was born. And as strange as it may sound, as long as I’m in NYC surrounded by her skyscrapers and brownstones, and even when I’m alone, I am never ever lonely. She’s a warm blanket and a cozy cocktail. 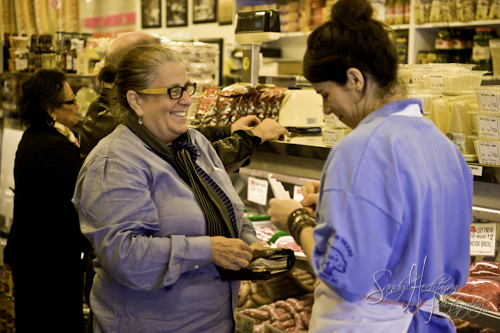 And only a New Yorker understands her offerings and gets her gifts. 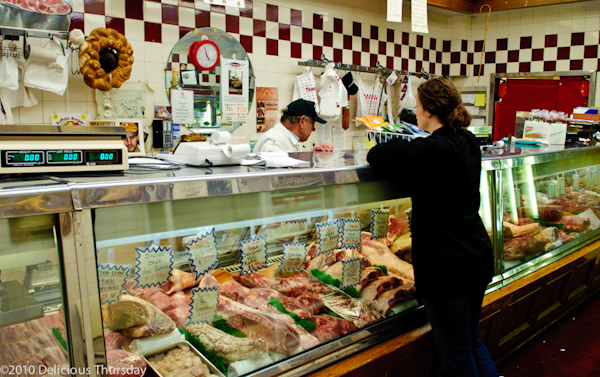 So sometimes, as in the case of Hinsch’s, we save the city. And sometimes, the city saves us. We all suffer in silence at select moments of our lives. And just when we need it most, sometimes someone swoops in and gives us a save. My only question to you is: Who or what saved your soul in these last few seasons of your life and are they even mildly aware of their influence? In addition to egg creams and countless other items (I had the utterly amazing Chicken Cardinal with fresh local mozzarella and roasted red peppers on ciabatta lightly brushed with herb butter) that fare much finer than so many other diners, Hinsch’s still sells those sweet handmade confections as it has for 60 years. Their nonpareils are the best I’ve had and well beyond any boxed candy variety. And it’s perfectly appropriate that those dark chocolate discs dotted with white are Hinsch’s bottom line best seller since the French word nonpareil literally translates into: having no equal or unparalleled. I think it’s fitting. 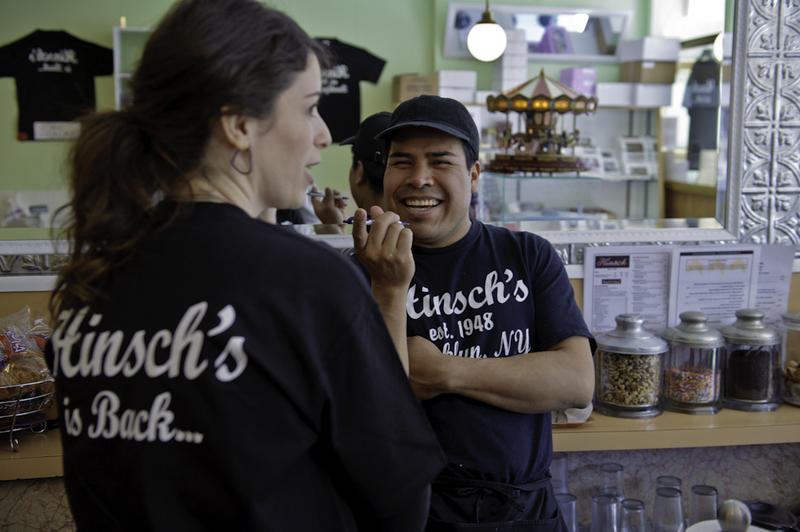 Be sure to stop by Hinsch’s Luncheonette in Bay Ridge, Brooklyn and visit with our hometown heroes, Roger & Raul. And maybe even wave hello to Julie, and James of the FDNY. 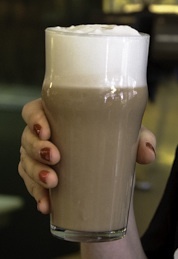 And don’t forget to order an egg cream for an experience of unparalleled proportions. Summertime – a season truly carefree in character – has ended. The 90 degree days have faded fast and I have started to feel those fall winds begin to blow. My strappy sandals are quickly replaced by my newly bought boots. Gone are the days of sweltering city walks, dips in my parents pool and trips to the beach – both Long and Brighton. As the mercury hits the high 50’s for the first time, I turn off my overworked air conditioner and open the window by my bedside, allowing the cool courtyard breeze to enter. 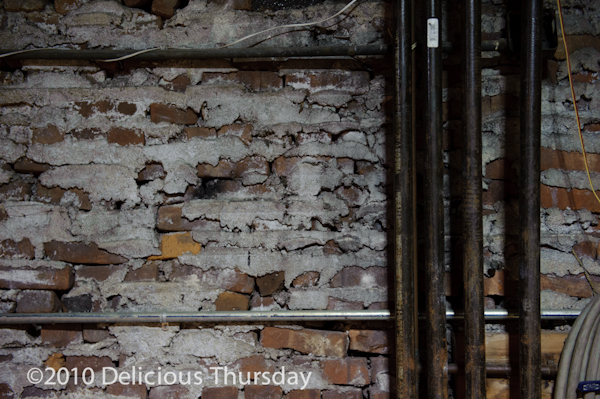 I look longingly at my unused fireplace and survey my cabinets for soups, stews – and pastas too. 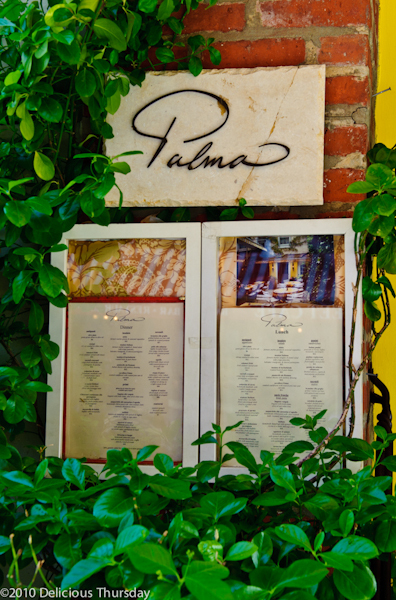 With fettucini in my future, saying goodbye to Summer is suddenly less stressful. 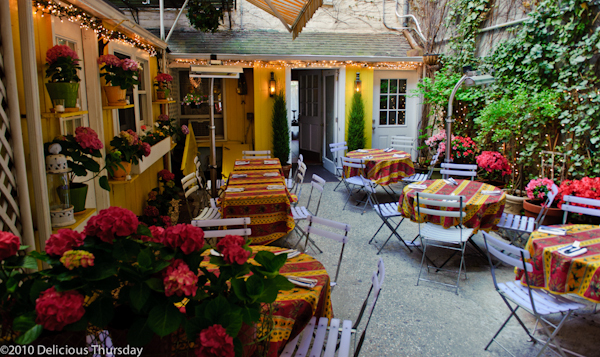 Pasta – the ultimate Italian comfort food – has found its way into my Fall fantasies. But my kitchen survey reveals sad results: one half-full, half-eaten box of De Cecco brand Rigatoni no. 24. 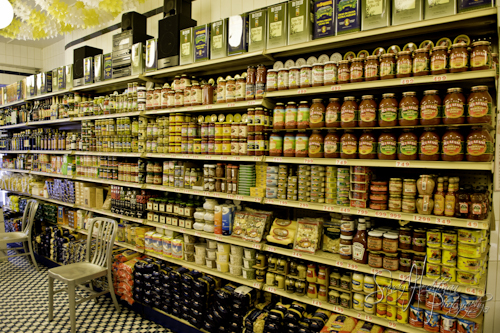 My pantry is paltry. My dried, boxed, decade-old pasta leaves me disappointed. 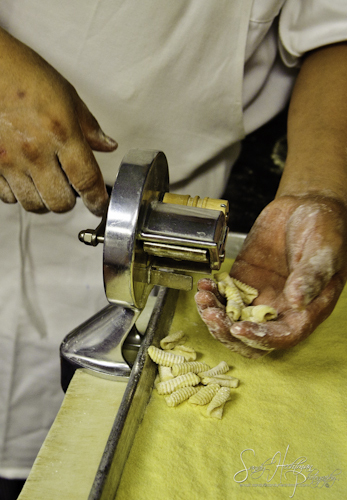 In my quest for perfect pasta, I spent last Thursday learning the art of making and molding fresh pasta at Centro Vinoteca. It is Noon on Thursday and as I stand on the stoop of my Cornelia Street apartment I can hear the church chimes beckon me towards my next assignment. As the first fall breeze blows, I quickly cross over the cold and congested 7th Avenue to the calm and quiet streets on the other side. Our Lady Of Pompei rings her last bell, and just in time, I arrive at the sleek and stylish restaurant at 74 7th Avenue South. 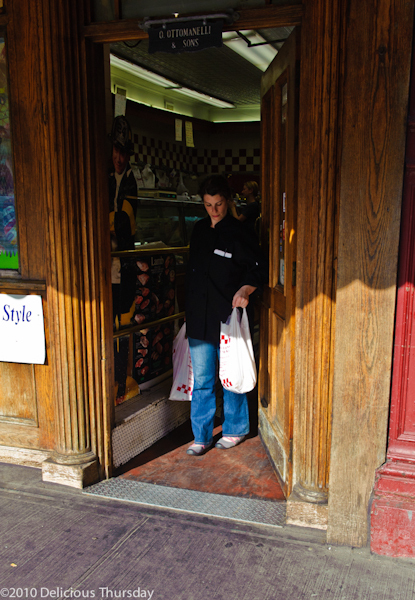 I round the red brick corner and arrive at the open doorway – the cool, calm, strikingly clean interior draws me inside. The inventively shaped corner building and movie theatre marquis above the front door inform me that I am in store for a show unlike any other. 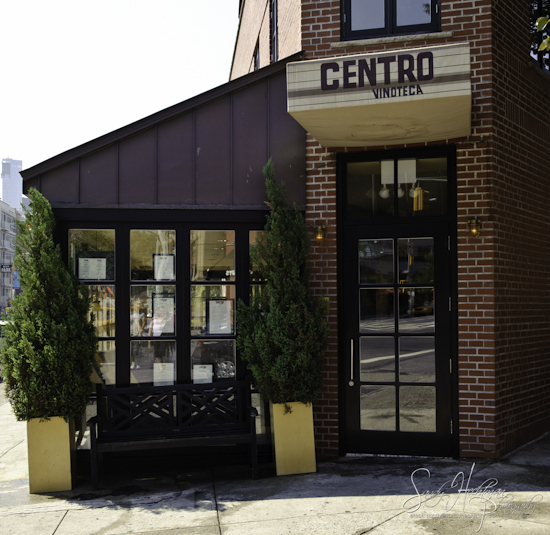 Centro is stylish, swanky and smooth – as are the two brothers at its helm – Enver and Rizo. Everything is bright and white as the light floods in through the floor to ceiling window panes. 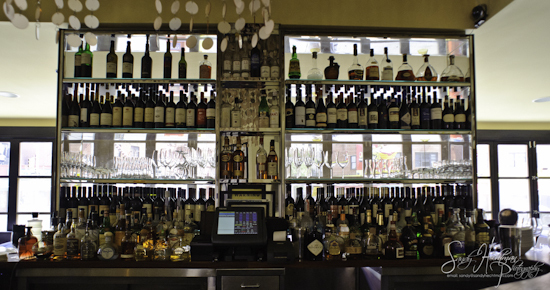 Each curve and bend of the oddly shaped bar begs you to join her for a drink. 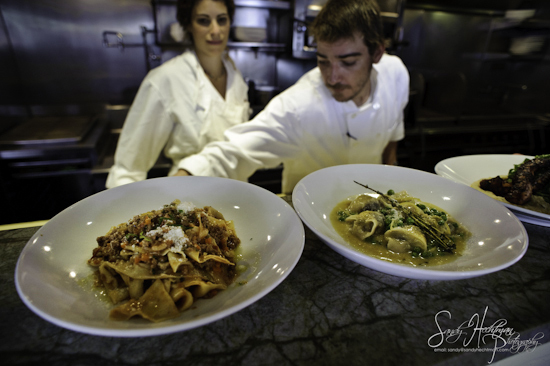 The aromas from open kitchen tease, tempt and toy with you as they urge you order something more. 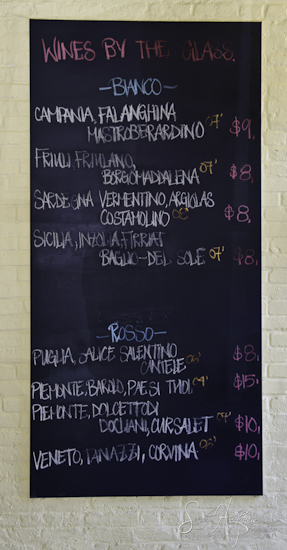 The colorful chalkboard menu demands that you dabble in the dolci of the day: Fresh Ricotta Cheese Cake with Slow Cooked Apricots & Mint. 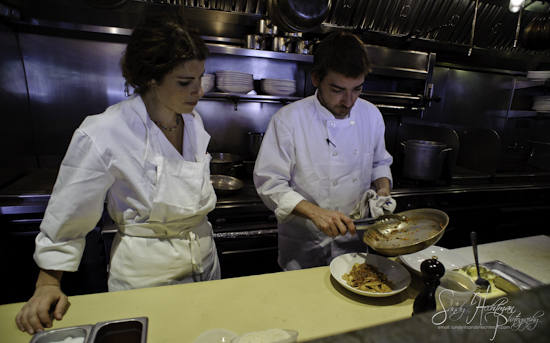 The only thing that would make that dessert more delectable is if Enver or Rizo would deliver it to you. In here, it’s comfortable but cool. In here it’s classy but casual. In here it’s airy and open and always inviting. In here, it’s almost always summertime. And brothers-in-charge Enver and Rizo would be your ideal beach companions. As quickly as I arrive I am shuttled to the lower level to begin my pasta prep. 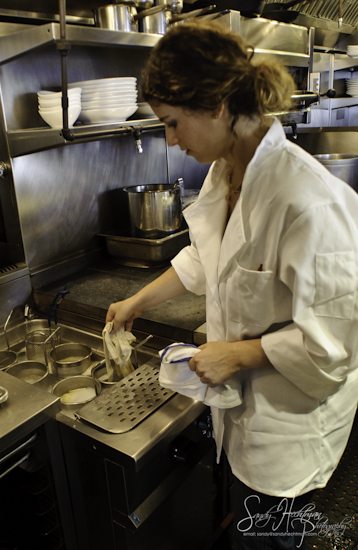 The prep kitchen is as clean as my apartment – only after my parents arrive for a visit. 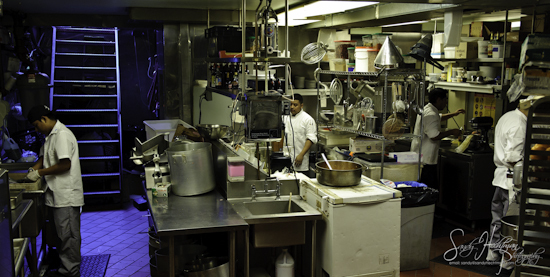 Shiny equipment, stainless steel pasta dough mixers, and enthusiasic workers fill the space. But those cool afternoon winds never wind their way down here. 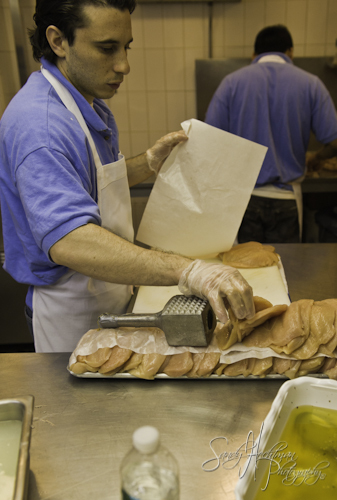 Busy workers and boiling bowls of red sauce raise the temperature by 15 degrees. My only escape is the refreshingly cold but painfully brief breeze I feel from the oft opened freezer door. Despite the heat, I attempt to explore the endless possibilities presented by pasta – which starts so simply with eggs, flour and salt but becomes so much more. I meet Humberto – affectionately know as the pasta guy – and he talks me through the series of shapes we are about the prepare – six in all. 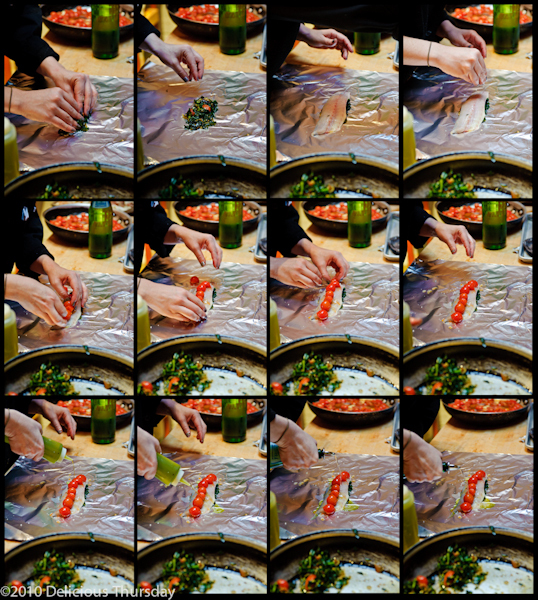 I love the idea that by simply changing the shape of the pasta – the tabletop is transformed. 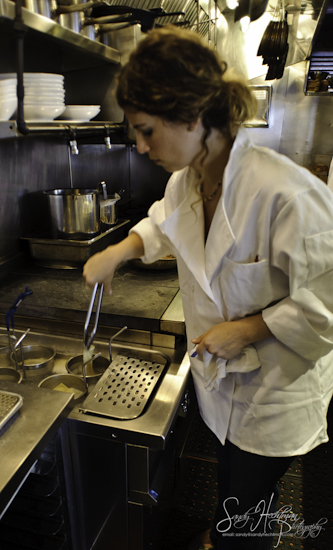 Cavatelli cups its sauces. Papardelle playfully dances with its braised lamb. 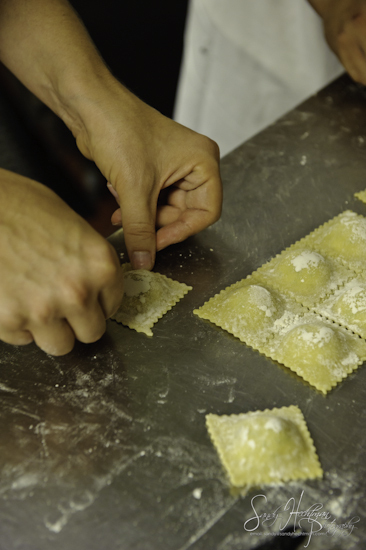 Ravioli wraps around its ricotta. 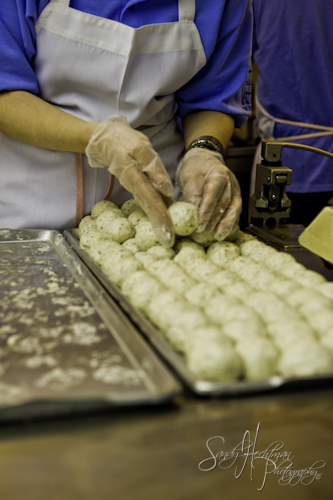 Same ingredients – yet such dissimilar results. But I am suddenly humbled by Humberto. My formative pasta years involved a battle between Ronzoni brand Spaghetti versus Ronzoni brand thin Spaghetti. There was little diversity in our dishes and I have so much to learn from my new friend. 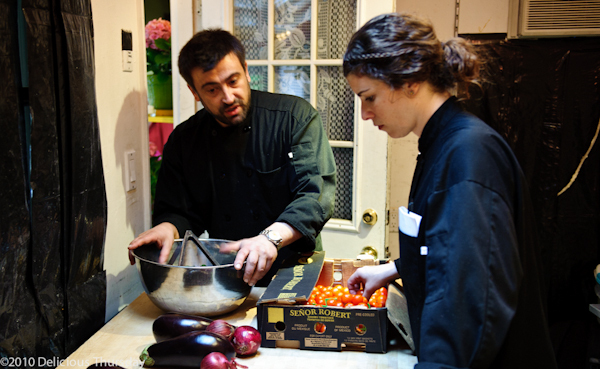 Humberto explains the seemingly simple steps and the types of pasta we need to prepare for tonight’s menu. There are so many that my mind is racing and I am ready to run home to grab that box of dried pasta from my shelf and dump it into a bucket of boiling water. 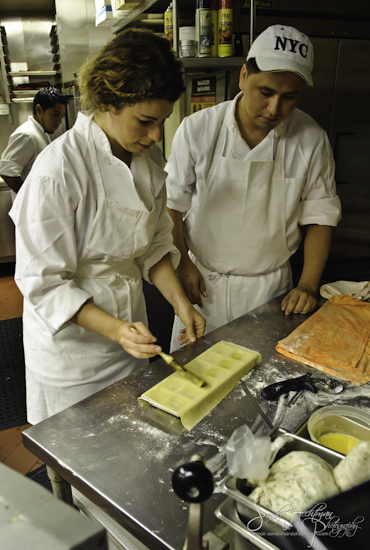 But I wait, and make an attempt to learn these lessons – with Humberto and his 3 years of pasta prep hovering over me all along the way. 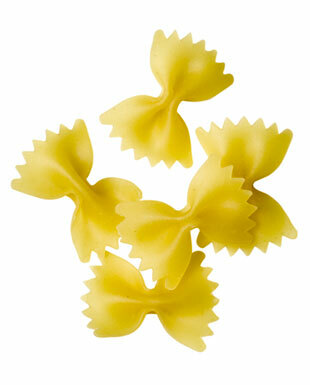 I lay one thin sheet of pasta dough atop my new favorite tool – the italian ravioli maker. The pasta is so thin – so delicate – I can see my fingers clear through the other side and fear I might tear it if I tug too much. Humberto assures me my sheer strength won’t damage this delicacy. 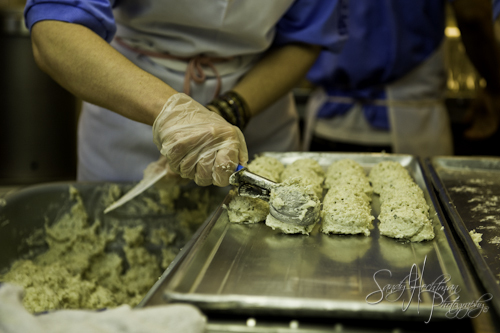 I brush the pasta with a light coating of egg mixture and dot each chamber with a concoction of cream, chives and shrimp. I place one pasta sheet on top to cover my creation and our ravioli is mere moments away from being born. 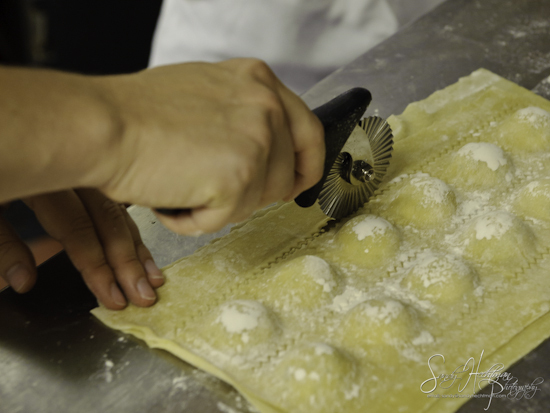 We pinch and seal each side and roll the fluted pastry wheel (also know as a ravioli cutter) along the edges and between each piece. My unsteady hand seems to snag the ravioli ending in an uneven and imperfect pocket. Humberto corrects my work and guides my hand along the way. 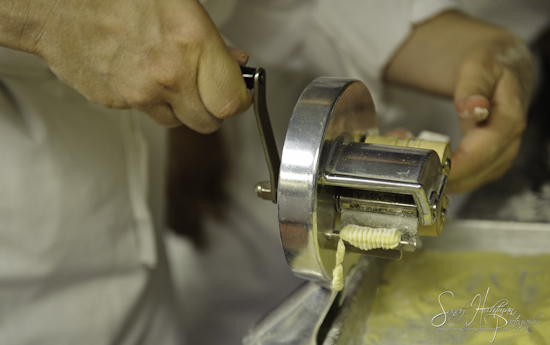 Making pasta is a delicate dance – a tender twist as I try not to tear or tug the soft sheets of dough. At the end one of session – we have only 12 raviolis to speak of. We’ll need many more if this dish is on the menu tonight. 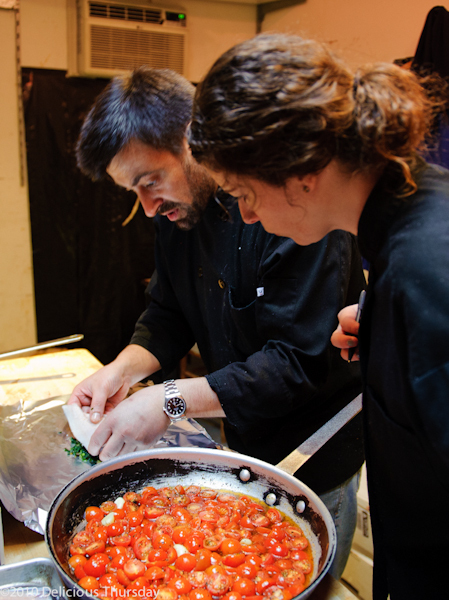 I’m losing hope in my pasta prep but Humberto and I continue to work side by side and make some more. Each little pocket is looking better than the one before: the filling is just right, the sides are sealed tight and the perferations are now perfect. 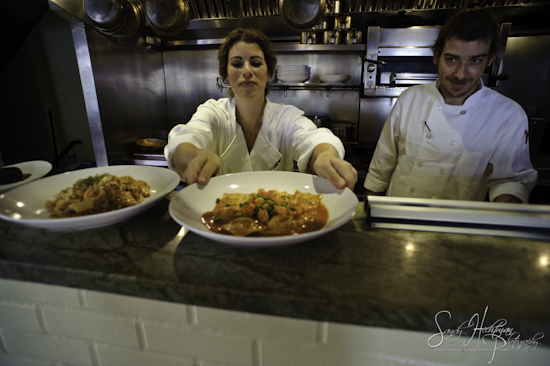 The word Ravioli is said to have originated from the word Rabiole – meaning things of little value or left-overs. 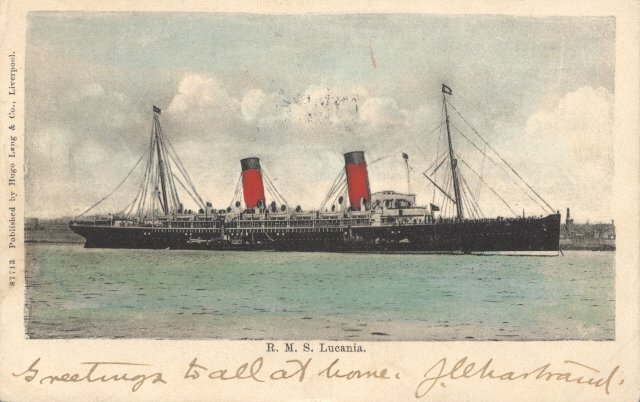 On long journeys by ship, sailors – not wanting to be wasteful – collected and chopped up all the left-overs (the rabiole) from their meals. They stuffed those leftovers into little envelopes of pasta dough. I, too, have found myself feeling much like the ravioli I have just crafted. On my best days I feel firm and presentable on the outside. And on the inside – and on my worst days – I have felt glimpses that are reminiscent of that ravioli: that I have little value or that I have been passed- or left-over. Chalk it up to those unpopular junior high school years. Or maybe it was that moment, when one year ago I sat down across from my live-in boyfriend of two years and by the end of the evening I was not only short the $25 dollars for the cost of the meal, but I had to subtract one boyfriend and one apartment from that scenario. Homeless, aside from my sisters couch, I started to feel a bit like those ravioli of yesteryear. Ravioli, however, has come a long way. 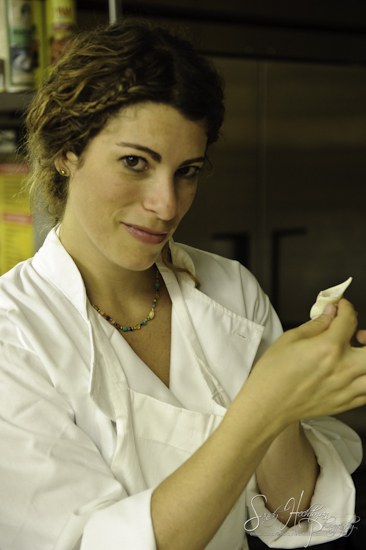 Gone are the days of leftovers encased between two thin sheets of pasta dough. No longer are they filled with things of little value. Now their inner workings are so precious and filled with such worthwhile ingredients – think: shrimp, chives and cream at Centro Vinoteca – that our main task (Humberto’s and mine) as it relates to ravioli is to be sure that those insides don’t escape their safe shell and find themselves floating around a hot pot of boiling water. 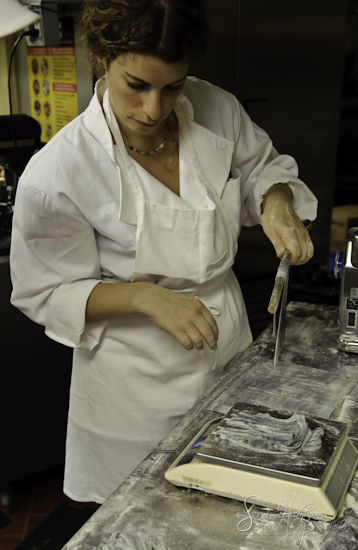 After we fill the ravioli we press the edges to ensure they are sealed. We press. And we seal. And we press again. 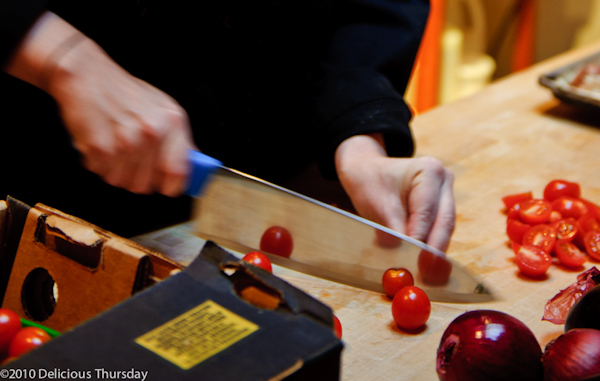 This small task is life or death for our dish. And we learn that even though something starts out being undervalued or looked over, the world eventually comes around to getting it right. We are no longer in high school and gone are the days of that disasterous Greek meal on Amsterdam Avenue. 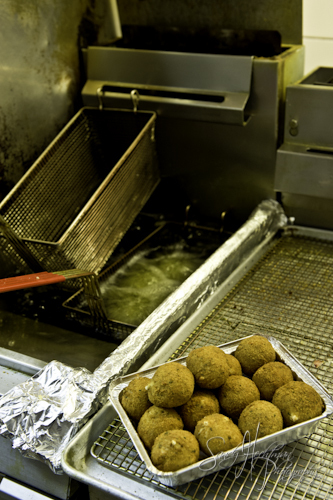 Our ravioli is sealed with goodness inside. No shrimp will dare swim away. And your tastebuds will be the better for it. Humberto and I continue with Cavatelli. 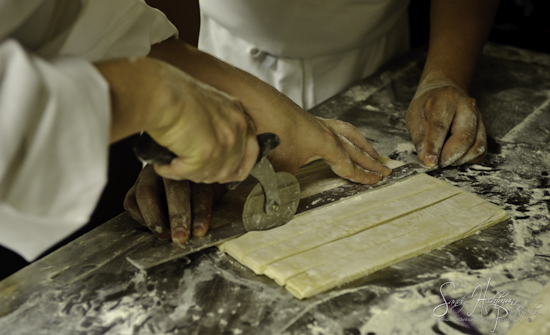 We slice our pasta dough into a long sections about 1/3 of an inch thick. 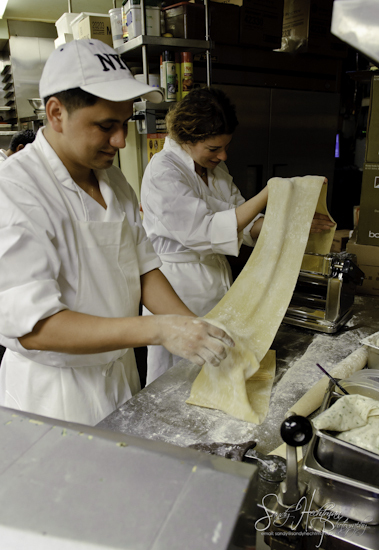 After a quick lesson, I begin to roll the dough gently through the italian imported cavetelli maker and spin out a series of shapes that are ripe and ready to be joined with broccoli rabe. This task is remarkably easier than the one before. 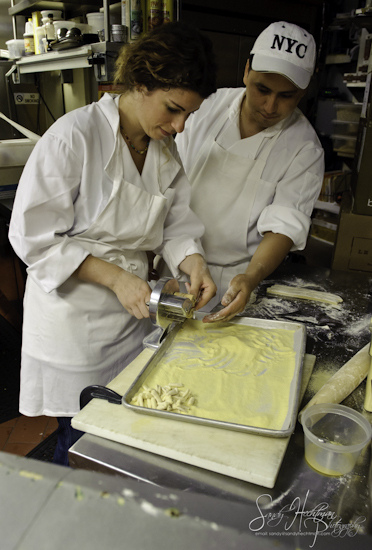 And while cavatelli is traditionally made by hand (think southern italian or sicilian grandmother cooking in her home kitchen) I have a newfound appreciation for the tools of the trade. The word Cavatelli is derived from the Latin word cavum. Cavatelli means a hollow or cave; a hole, a cavity or a depression. In my hometown of Hampton Bays the day after Labor Day was referred to as Tumbleweed Tuesday. It was always a sad day. A sense of loss prevailed – a loss of the freedoms that summer afforded us. 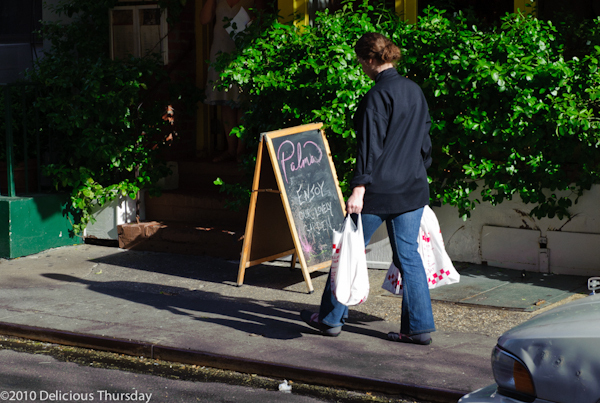 Summer has indeed ended and a palpable shift has take place – here in NYC and in Hampton Bays too. And with its passing I am left with an empty space, a deep void — a cavum. But within that loss there is now a space for something more to enter in. In that cave – that hole, that depression – enters something new: new friends, new classes, new goals and a new space and clean state to begin again. In that space of our cavatelli – in that soft and subtle void of our pasta shape – there is space for sauces: for pestos, for browned sage butter and for bolognese too. I am beginning to rethink the very definition of depression. 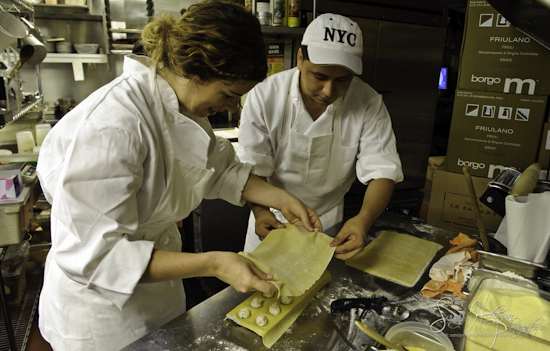 With ravioli and cavatelli completed, we move on to long strands of papardelle and pici, to roasted mushroom stuffed cappellacci and spin out some beautiful black tagliatelle. My arms are getting tired and my fingers are freezing up from all this pressing and pushing and molding and manipulating of these pasta shapes. I will never look at a plate of pasta without imagining the hours of labor involved. I run upstairs to take a breather. 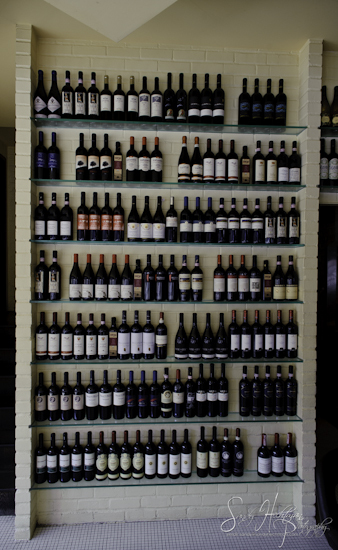 On my way, I hesitate for just a moment and stand in awe of the hundreds of bottles of wine that line the walls – all Italian and from regions of Italy I have yet to discover. I imagine a warm red would be the perfect pairing for the pasta I have just prepared. 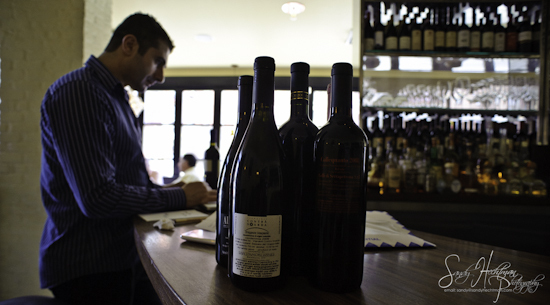 I must admit my wine knowledge is a little lacking and standing there with these bottles towering over me, wondering what I would choose – my confidence is shaken and my knees are feeling weak. Enver leans in close and whispers wine to me. He enthusiastically explains how he chooses his wines from lesser know regions, like le marche, based on its agricultural advantages. 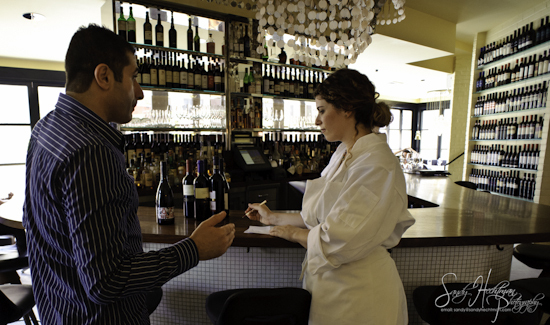 Speaking of advantages, Enver is an expert with his wines and you’d be remiss to not mark your calendar and schedule your own private tutoring session. 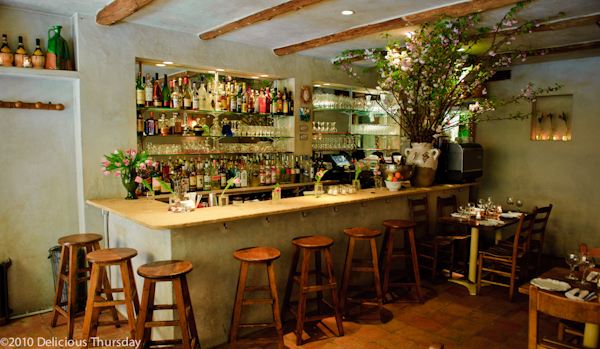 And if there is anything to get you out of your cavatelli cavum, your depression – it’s brothers Enver and Rizo, a seat at the bar and a glass of my favorite – and house favorite – bubbly: prosecco di valdobbiadene, terra serena. 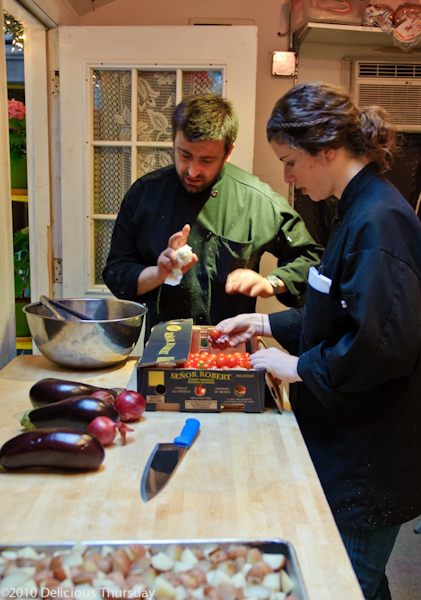 After my lesson in libations, I turned my attention to Greg Pollio for the final phase of my cooking class. Greg, the former student of ornithology (think birds) and herpetology (think reptiles) turned Sous Chef, guides me as I plate my well-made papardelle. 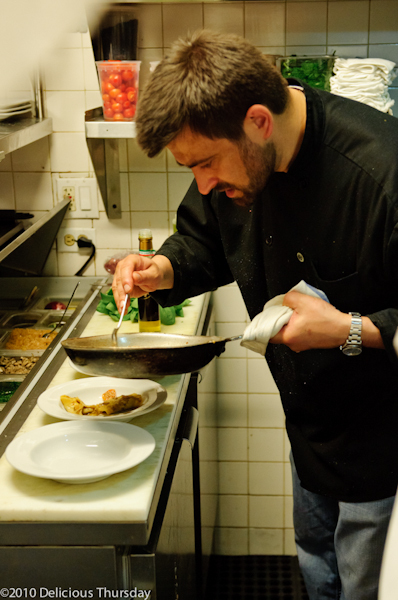 Greg’s study of the sciences makes him a master in the kitchen as he teaches me about the subtleties surrounding pasta shapes and their contrasting cooking times. My pasta hits the hot water and hovers there for mere moments. All the while I am sauteeing Greg’s braised lamb bolognese and seasoning it with white wine and mint while my pasta cooks for what seems like a split second. Before I plate the papardelle I stop and perform my most important task: The taste test. I bring the sauce straight from saute pan to the spoon and into my mouth before it ever reaches the dish. There is nothing quite like that first forbidden kitchen bite – and the assurance that you did everything just right. Greg’s bright eyes, even brighter smile and his easy and natural way around the kitchen make you want to take him home along with your leftovers. 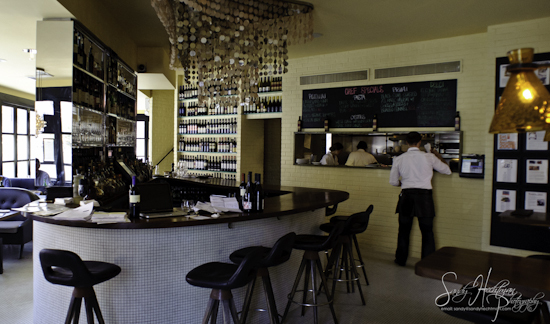 If you visit Centro Vinoteca I’m sure you’ll agree that Greg only adds to the atmosphere inside. And I’m doubly sure you’ll understand the sentiment: Thank you open kitchen. When I left Centro Vinoteca I noticed a few leaves had fallen and the winds began to pick up and swirl around the sidewalks. I held a sense of renewal in my heart and a flutter inside for what might be to come. With these fall winds beginning to blow and the new year upon us, I have started to feel far away from any resemblance to those left-over filled ravioli. I’m not sure if it was the change of seasons, or the bright and futuristic chandeliers floating overhead at Centro Vinoteca or the smiles on the faces of Enver and Rizo and the regulars than dine there, but now I am feeling much more like the one pasta I didn’t even prep: farfalle, and its literal translation: butterflies. I’m hungry and I’m bored. I’m hungry and I’m home and I’m not quite sure what I want. 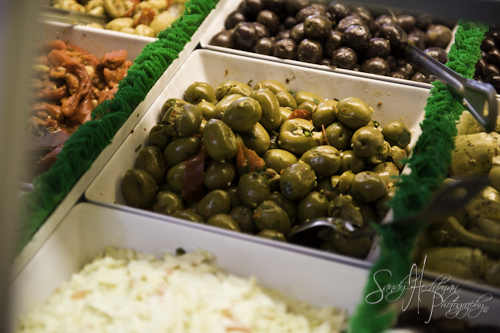 But then again, I’m never quite sure what I want – and that feeling doesn’t simply stop with my summertime snacks. What do I want out of my life, my career, my next relationship and most important, what do I want for lunch? The latter being the more easily solved. Questions so challenging I’ve taken to trying technological tricks and tactics as a fast fix. Technology has, seemingly, become my ally in my quick quest for everything from companionship to couscous. It’s gotten bad. To choose my meals I’ve been using the Wheel of Lunch to sort through the possibilities and narrow the field. For dating I’ve resigned to relying on late night lurking of online profiles. 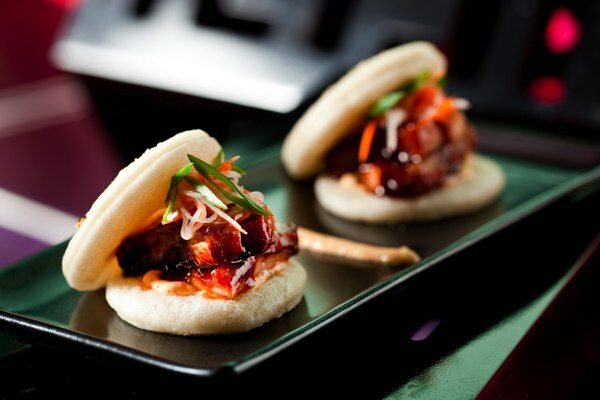 As I peruse the online prospects and meander through Menupages, one thing becomes clear – no picture on the page of my Macbook (be it a handsome bachelor or a Momofuku Pork Belly Bun) makes my quest any closer to conquerable. The online search is far from the solution I seek. Finding fantastic food in this fair city and finding equally fantastic friendship is not as formulaic as the reviews would have us believe. I’m hungry. 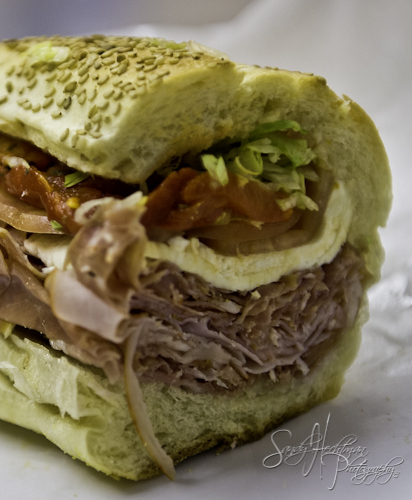 I go online to seamless web and drool over photos of food – tasty morsels only 30 minutes, 4 flights of stairs and a friendly delivery guy away from my plate and my palate. The food arrives bruised and battered from its journey – 35 blocks is a long way to travel. I end up disappointed that it does not resemble its photos. Somehow, it’s less tasty. My hopes are dashed. Online dating is just the same. I start out hungry. Hungry for something, some one, some conversation, some compatibility. 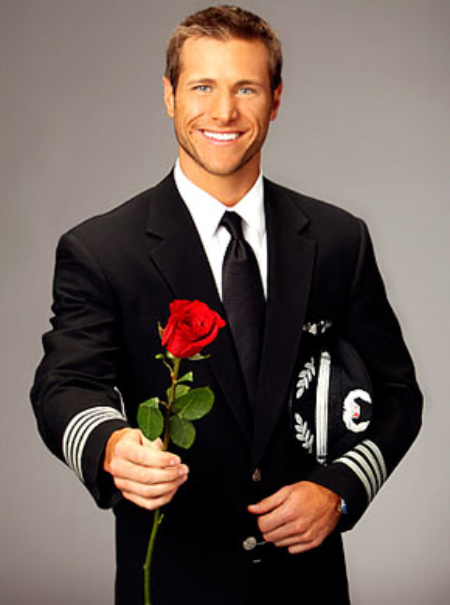 I log on and drool over photos of a guy – a tasty morsel only 30 minutes, 4 flights of stairs and a friendly delivery away. He arrives bruised and battered from his journey – 35 years is a long way to travel. I end up disappointed that he does not resemble his photos. Somehow, he’s shorter. My hope are dashed. And what about me? What will he think of the real me versus the fantasy me? Will AmyWVillagegirl match up to his expectations? What if my laugh is deeper and heartier than he thought it would be? What if I curse more than he hoped? And what will he think of me when I don’t match up perfectly to my photos or his fantasies? He might like the photo with the curly hair and I show up after an hour of flatironing. He might like the picture in the red dress with the view of The Collesium in the background, but I show up in jeans and we’re far away from the romance of Rome. It’s all too much pressure to place oneself on a pedestal to be judged and sized up from the outside in. I mean, I’m fine if you want to judge me as I walk down the street – but I’d rather not pay the forty dollar fee for such a service. It is a contest I will not win. The buildup, the photos, the supposed perfection of it all sized up in a 400 word essay About Me and About My Date. At a time when our technology has us seemingly so connected, I started to feel disturbingly distant. I spent more time online than outside. 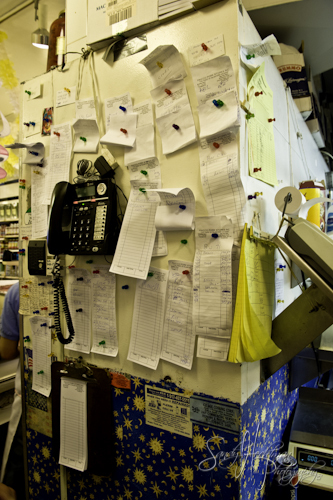 I spent more hours reading NY Times restaurant reviews than being the reviewer myself. I decided to switch off my ipod, put down my blackberry, and shut down my laptop. So I officially logged off from online dating and I decided to peruse my plates in person instead of online ordering — all in an effort to reclaim my identity as a self proclaimed old fashioned gal. I will look a stranger in the eye. I will say hello to my neighbor. A little experiment, a little test – far from the cruel contests of online love. So far, things are seeming more organic, more fluid and I feel more present. My mission is much less a search and destroy, and much more a see and discover. 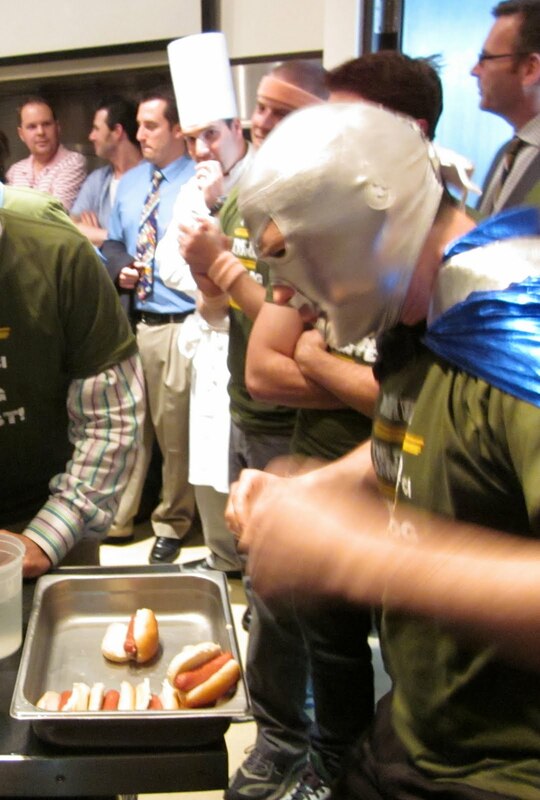 And now the only contest I want to participate in is that all american hot dog eating competition. The only thing I want to judge is my food. Luckily, I spent my Thursday serving as a Judge for the Concours de Chien-Chaud (AKA: Hot Dog Eating Contest) at the French Culinary Institute. My assignment: The condiment contest. Now thats a contest I can sink my teeth into. 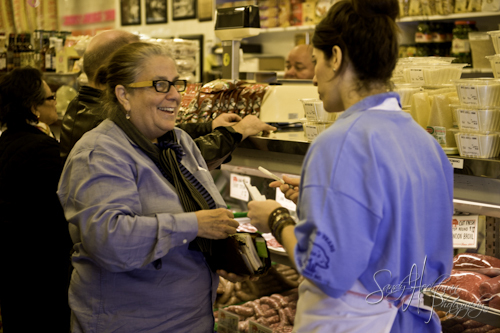 Happy to be the judger and not the judgee of this contest – I sauntered south to SoHo and was welcomed by the staff. I was escorted into a room filled with custom-designed equipment — from Jade ranges to Winkler Wachtel deck ovens to Vulcan Swiss kettles — where eager students stood before me just asking to be evaluated. I would not judge them on their looks, nor their personality. There was no swimsuit competition in their future. These students will be judged on their creativity, their inventiveness and their skill. Their challenge: To concoct the perfect hot dog accompaniment. And my job: simply to eat. I move from station to station – from Roasted Red Pepper Date Sauce to Caramelized Vidalia Onion, Pineapple & Mango Relish evaluating each bite for texture, taste and transportability. I look around the room at the serious students standing before me with their brows beading with sweat. 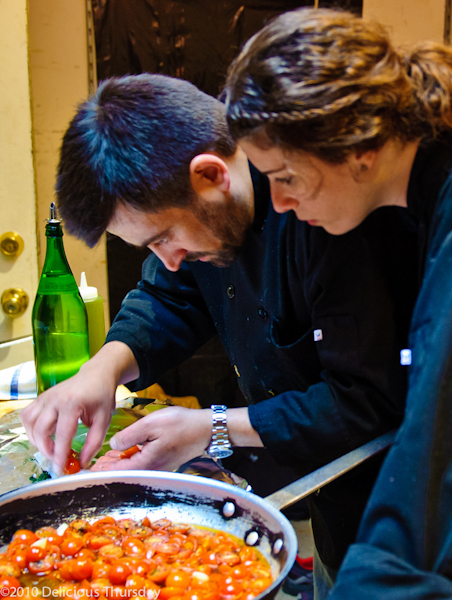 I sense their nervous energy as they list their ingredients and instructions for preparation. And as their sentences begin with a stutter, I pause to notice my heart has begun to skip a beat as well. And even though my food — my condiment in this case — is not on the chopping block, I somehow feel uneasy. As I move from condiment station to condiment station my temperature rises – and not just from the enormous amount of hot dogs of have just inhaled. I diligently jotted down notes, scribbling key words and phrases here and there: sweet vs. savory, spicy vs. mild and inventive vs. old school. 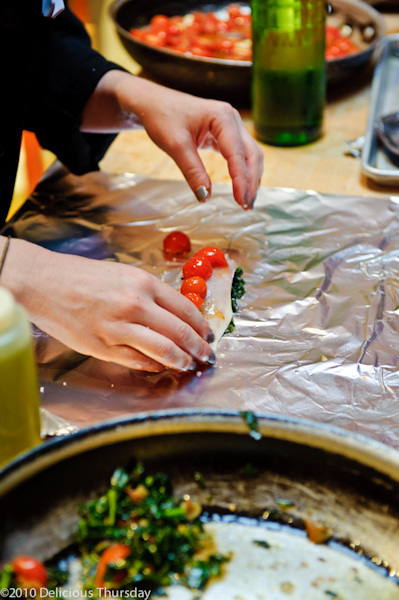 The flavors begin to run together. The criteria becomes confusing. The memory of what I tasted only moments before begins to fade. The faces of the students become blurred and my mouth is now ablaze with Spicy Roasted Red Peppers. My belly is full and now — so too is my brain. I escape the room and wander off down the hallway to quietly collect my thoughts. What right do I have to judge? 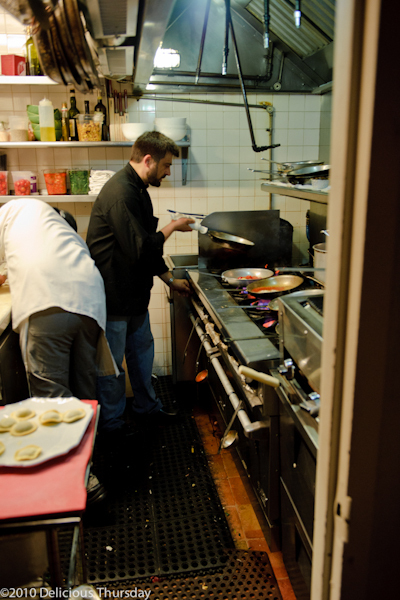 At a time when everyone seems to be an internet food critic, I wonder: who am I to say which dish shines? Feelings of insecurity come over me and I am sure I am now feeling more pressure than those students in the spotlight. But aside from my own feelings of inadequacy and separate from the stress and the pressure placed upon my palate, one burning question begins to plague me: How will I know when I have found the one – for food, or for friendship. Will a rating system help or hinder? Should I write down all of my qualifications on paper and check them off accordingly? Should I close my eyes, spin around and pick one? Or, will I just know when the right one – the winner – comes along? On my way back down the hallway, as I fret over finding a fix and selecting a solid winner, I locked eyes with good-looking guy. With my pact to meet people in person instead of in the online universe, I decided it would be a good idea to simply say hello. So, I said Hello. Then, he said Hello. I smiled. He smiled back. I told him my name was Amy. He said, “I’m Greg.” We stood staring for what felt, in those early stages of attraction, like an eternity but was, in reality, merely a minute, a moment, a second that stood still. When the moment passed and we came back down to the universe we continued to talk as if not a beat was missed. He was instantly warm and easily engaging to the eye. He wore a silly tie and pleat-front pants. We soon were entrenched in a deep discussion surrounding the challenges of choosing the right condiment for your hot dog. Greg certainly knew his hot dogs after having spent a lifetime surrounded by his family’s hot dog business (a NY favorite: Sabrett) and he was a stickler for staying true to what he considered to be the ONLY hot dog condiment that made any sense: Spicy Brown Mustard. 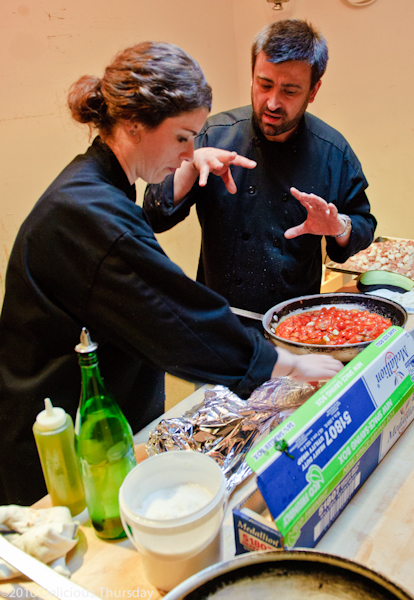 Between judging the condiments for their viability and evaluating Greg for his viability I was becoming overwhelmed. And then, I discovered something. Greg was young – nearly 7 years my junior and well out of the desired age range listed on my online profile. Greg wore an Irish cross around his neck – not even remotely the type of guy I would find in my late night scans through jdate. Greg didn’t match up to my height requirements and his facade on this day – in those pleat front pants and quirky Sabretts tie given to him by his grandfather – would never have passed my initial internet sight test. But he had something. I felt something. 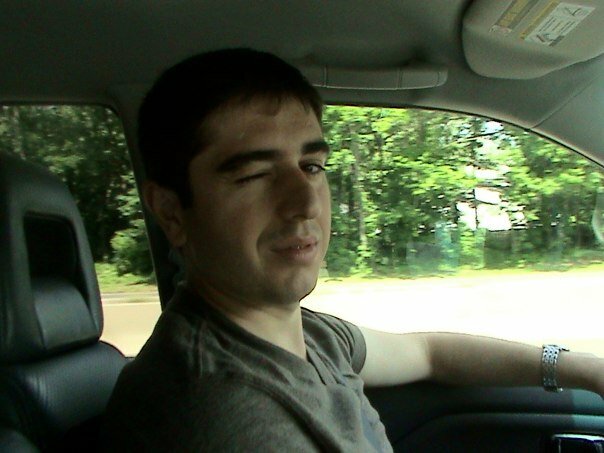 And through his eyes there was a connection that hadn’t been matched in my last series of blind dates. In fact, I discovered, I’d rather not be blind. I’d rather see. Even if that means I have to wait and see – or wait and wait and wait and then see. And then I discovered something else. I left Greg and headed back into the condiment contest kitchen. I tasted the last and final topping and I instantly knew I had found the winner. There was no questioning, no notes to refer back to, no tally to count. There was just one clear winner. It felt right and I knew it in a place far, far from my brain. I knew in my gut – that deep, center of the soul that sometimes screams to us so loud even when we try to ignore it. I knew that my taste buds were right on target and worthy of judging all of the condiment contenders. I knew the winner worked well not because of the notes I scribbled on my page, not because of some fantasy condiment criteria or list I had created in my head — but because my body told me so. And I knew greg was a contender as well – for a drink at the local bar, a meal in the east village, and a night out in the meatpacking district – all of which eventually happened. I’m no longer hungry. And I’m a little less bored than I was before. And even though it might take a little longer and require a bit more energy on my part, I’d rather search for my soup and my soulmate in the real world. 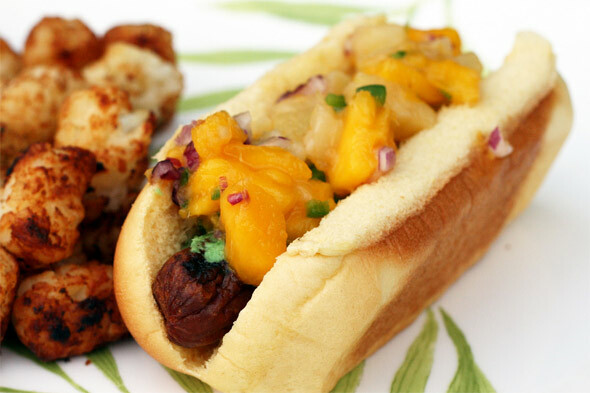 Here’s to my winner – Glen Cinguina and his Spicy Caramelized Vidalia Onion, Pineapple & Mango Relish for reigniting my enthusiasm and forcing me to trust my palate. And here’s to Greg for doing the same. Ollie has left the building. Ollie is – or shall I say was – my neighbor. We shared a building – and many a late night courtyard conversation. Ollie was the best at barbecues and the life of the party here on Cornelia Street. He had a knack for collecting friends as he strolled – simply with just his smile. Yesterday I came home to find Apartment 2F cleared out of its couches — and empty of Ollie. My neighbor (and friend) has moved out, leaving only a short handwritten note behind. As I walk through our empty apartment courtyard, absent of Ollie and his fun-loving antics, and as I pace over his spacious hardwood floors, I am reminded again that everything changes – for better or for worse. 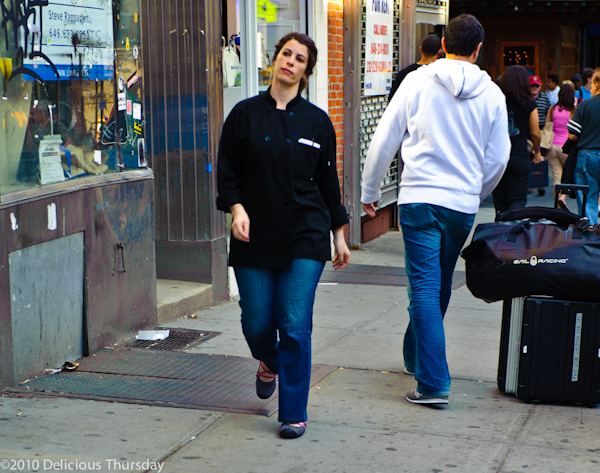 People exit our lives and babies are born, friends move away from Cornelia Street and new tenants come calling. Change is tough. Adapting to change is a talent. By force of nature, I think I am getting good at it. 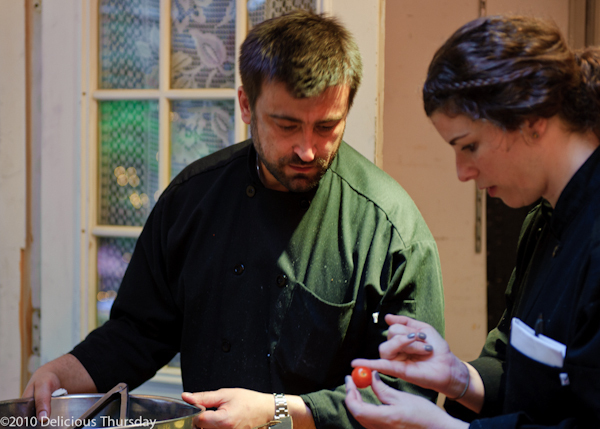 Almost as good as Chef Raffaele Ronca from last week’s Delicious Thursday – an immigrant who, 20 years ago, arrived and thrived in NYC. 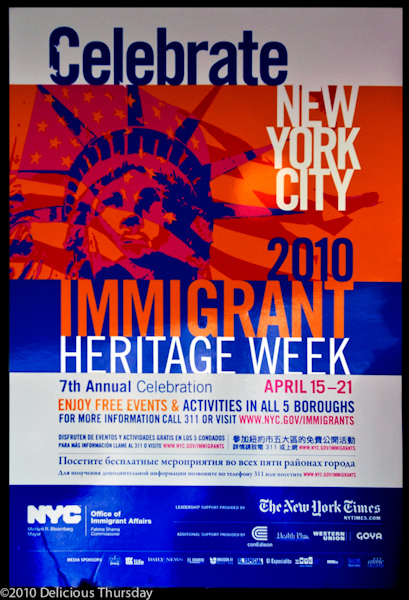 In honor of Raffaele’s journey to America and in honor of my own journey as recorded weekly on this blog, I was invited to meet Mayor Bloomberg and join him for breakfast at Gracie Mansion as part of Immigrant Heritage Week. Luckily, it happened to be a Thursday. 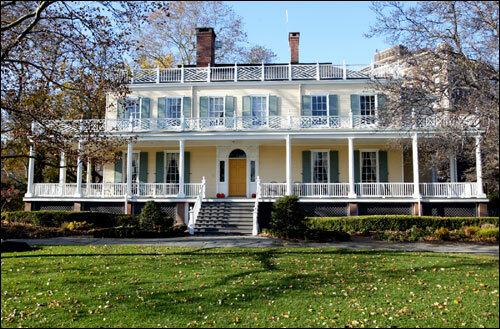 I walked up the wooden steps and circled the wrap-around porch of Gracie Mansion. Shortly after I arrive I am greeted by plates of sweetly syruped waffles swirling around the room. Baskets of bagels and international coffees abound. I wandered off to quietly collect my thoughts and stumbled upon the awesome acreage of this 1799 mansion – first through a room dressed in peacock blue, then passed the canary yellow quarters and finally into the dining room with walls dressed in The Gardens of France. The murals, mantles and moldings of this Mansion on East End Ave at 88th Street remind me I am far from my small studio on the West side. After a meet and greet with Mayor Mike – and a bit of breakfast – I head back downtown, before my subway car turns into a pumpkin. On my way home from Gracie Mansion I came across an abandoned chair sitting curbside. 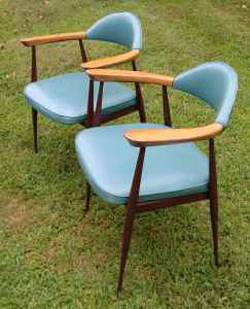 Perched on the corner of West 4th Street and 6th Avenue I found a perfectly good mid-century style teal blue armchair. Like any good New Yorker, I studied it, analyzed the wear and tear and then picked up the orphaned item and carried it to its new home on Cornelia Street. I will never know who owned it before I adopted it into my home. Maybe it belonged to an immigrant who had realized his American dream and moved on to fancier furniture. Possibly. 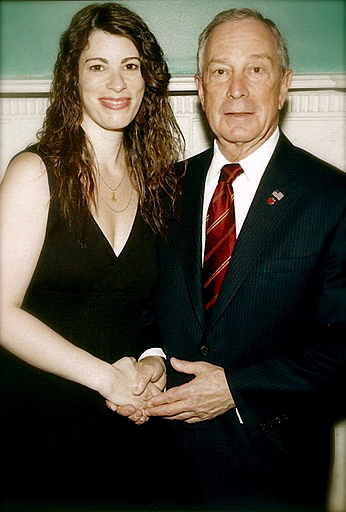 Maybe it was excess from Mayor Bloomberg’s Mansion. Not likely. 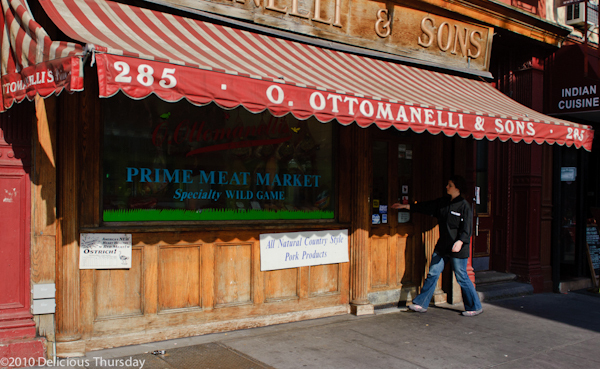 Or maybe it was Ollie’s – the last remains of his disappearance from Cornelia Street. I don’t know – but I hope so. What I do know for sure is that my new chair had clearly lived many lives, in many houses, and over many years. It is comfy and cozy. It is tattered and worn. A bit unraveled and unfinished. 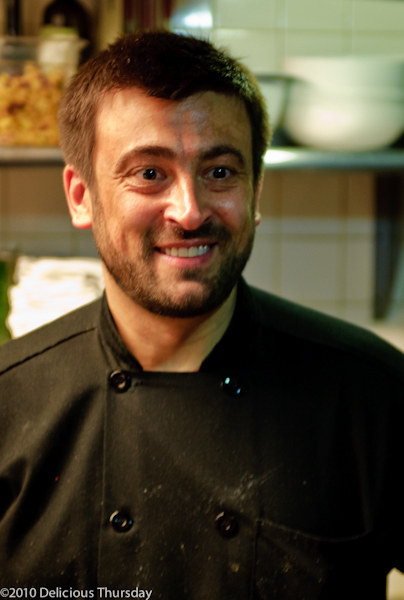 But it has substance and soul – just like me, and just like Chef Raffaele. What I also know is that if anyone wants to come over to my apartment, worn out or not – there is now a place to sit – comfortably. My chair needs a little work. But then again so do I. So do we all. None of us are excused from a little growth and development. Not even the Mayor. 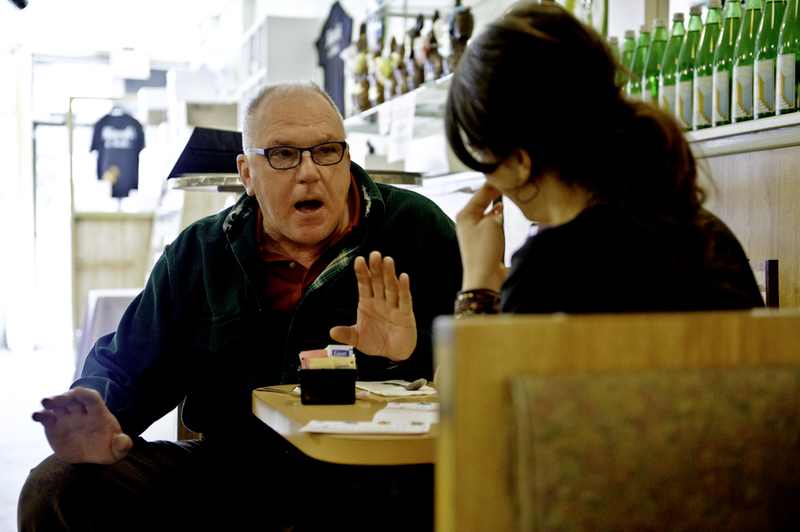 Not surprisingly, breakfast with the Mayor was less about breakfast and more about the Mayor — the experience, the house and mostly, the journey to get there. 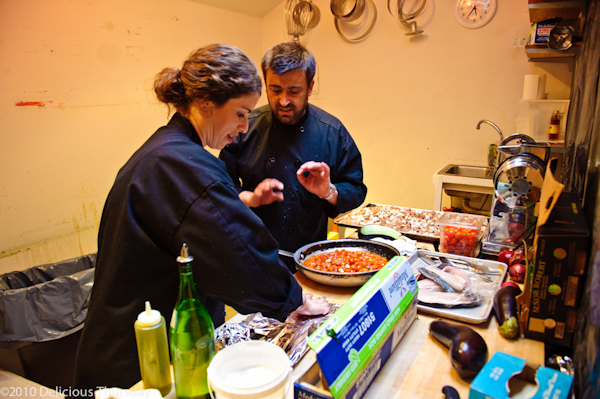 The food played backup to the story surrounding it – as it oftentimes does. 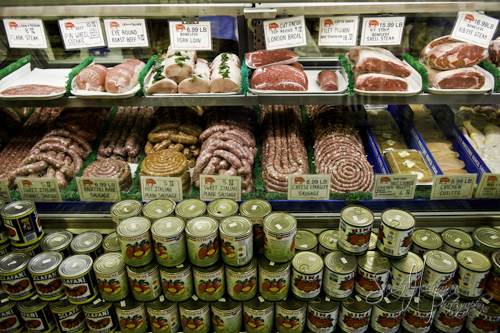 Next week our food focus returns. Until then, happy eating. All the signs are there: I’ve been sleeping with my windows wide open, cleaning out my closet, and leaving my scarf, hat and gloves at home in the hopes of greeting another 70 degree day. There’s only one problem. With last month’s butter-filled trip to the French Culinary Institute I have been feeling a little sluggish and not quite bikini ready. I need a miracle – a cleansing, healing, curative miracle. And I found one in Brooklyn. 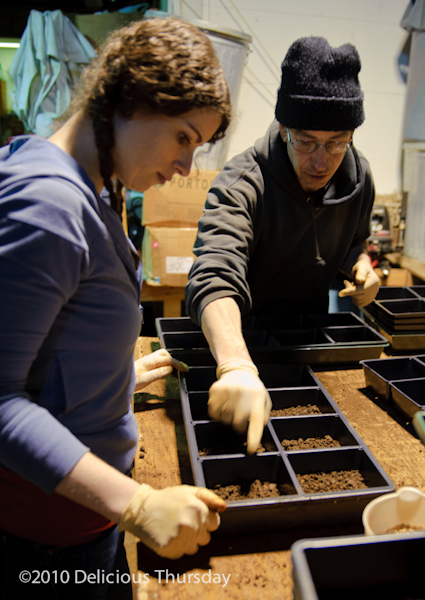 I spent last Thursday doing detox — and planting Wheatgrass with the friendly folks from Greener Pastures – an urban farm in the borough of Brooklyn. Later that week I experienced the medicinal benefits of the juice born of these blades of grass. I hopped on the R train and traveled from Union Square to Union Street. I rose from the subway stairwell in the Gowanus section of Brooklyn, situated roughly between Red Hook and Carroll Gardens. 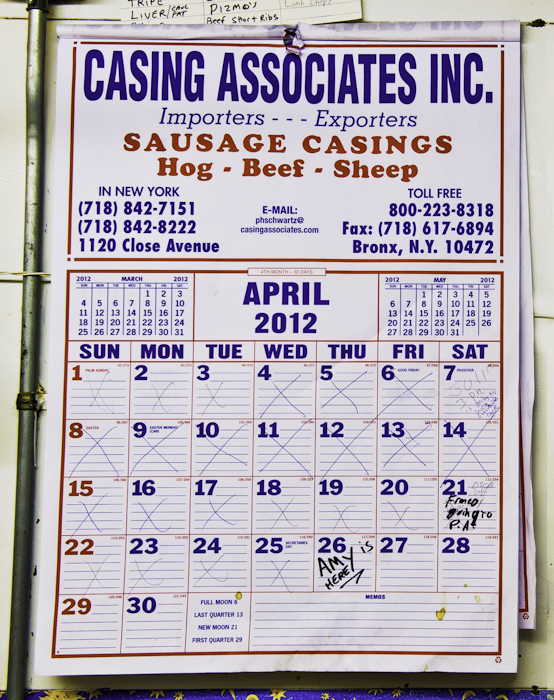 Gowanus is one of the few remaining manufacturing neighborhoods in Brooklyn. But if I am attempting a cleanse, I’m not quite sure the grit of Gowanus is the right place to get the job done. And how can a series of streets filled with steel and sawdust provide fertile ground for the growing? I round the corner onto Sackett Street and find the door marked 575. As I enter the grey industrial space I am greeted by Sam, Sascha and Stewart. Sam and Sasha are friendly canines. Stewart is a friendly farmer. Stewart even looks like a farmer with his grass stained jeans and his soil stained fingernails. Stewart is slender and strong. Hardworking and humorous. 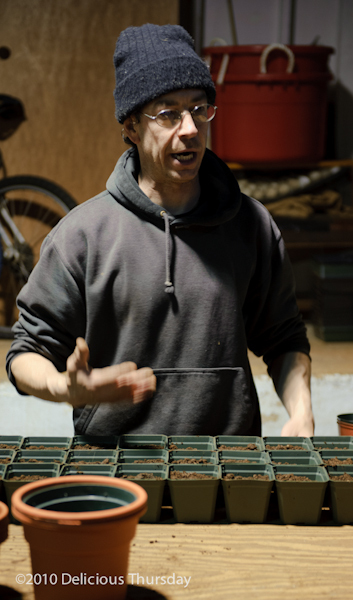 He is the doctor of the dirt who doles out his holistic drugs on a daily basis. I’m anxious to down my detoxifying drink but I am nearly 6 days away from that glass of grass. First, I’ve got to grow my own greens. I start by standing over a large stainless steel sink and scrubbing hundreds of plastic containers to prep them for planting. After dousing the plastics with a gunshot stream of water power I load the trays into the bright orange shopping cart. The cloud of condensation surrounding me feels more like a ride on the Maid of the Mist than a day on the farm. My rain boots are the only thing protecting me from the flood forming beneath my feet. I am soaked. Our planters are ready for soil and seed and I am ready to try my hand at farming – albeit urban farming. 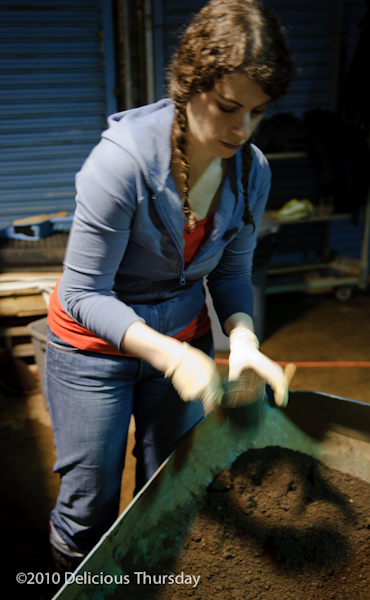 Like the passing of the torch, Stewart hands me a well-worn plastic Tupperware container and instructs me to dip it into the mountain of soil that sits in the wheelbarrow near our farming table. The Tupperware container happens to have the perfect measurements for filling our trays 3/4’s full with soil – it also happens to be discontinued. If I have learned one thing these last few months, it is that having the right equipment is essential to my success – so I appreciate Stewart’s attempt to hold the crumbling container together with many rounds of masking tape. 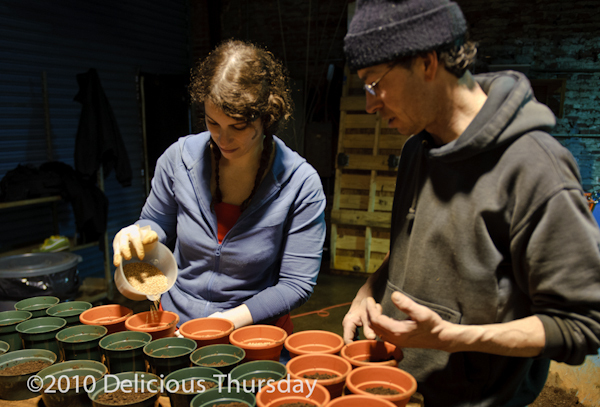 With our home-repaired version of a shovel, we spend the next few hours filling our pots with soil and preparing for seeding. 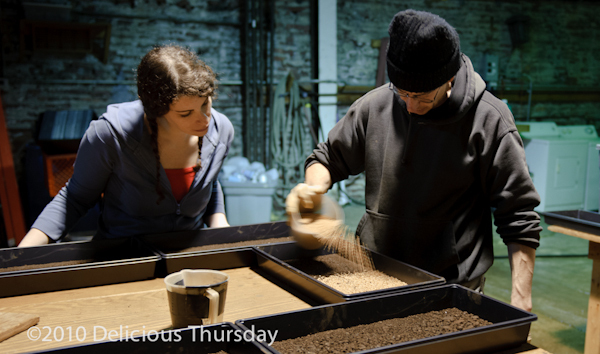 Stewart guides my hands as I gently sprinkle the wheat seeds in a circular motion atop the soil. I am shocked and surprised at how difficult it is to evenly seed the soil. On my first attempt my tray suffered from empty spaces and steep summits. Stewart keeps my spirits high with a series of jokes (a priest and a rabbi walk into a bar…) and stories about his urban farm (this space actually used to be a coffin factory). After a few tries I start to get a feel for it. The seed bucket becomes an extension of my hand and in one circular motion I start to evenly seed the soil. By the end, my 10th tray, I can close my eyes and still have a lay of the land. Stewart watches me like a hawk. Too few seeds and I’ll miss out on some body-healing blades of grass. Too many seeds in one spot and I’ll over-populate the soil. They should touch but shouldn’t be on top of each other. Sounds like a good guideline for first dates as well. My seeds are set. I am still soaked from my kitchen sink shower and now I am covered up to my elbows in soil. 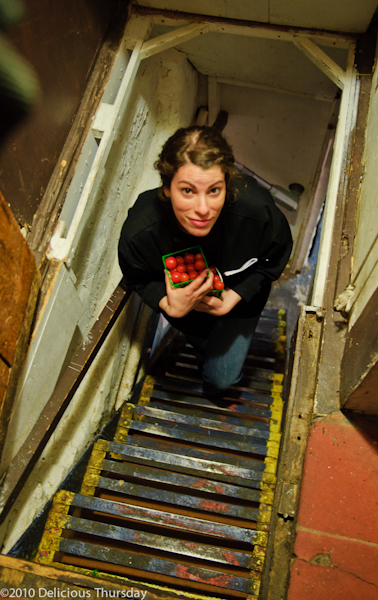 The warehouse is cold, damp and dark – and I am dirty. I’ve spent several hours digging in the dirt and seeding the soil and I am feeling frustrated. I wanted to purge my body of all that butter and add enzymes and amino acids to my system. I was hoping for purification, detoxification and rehabilitation. I was looking to restore the balance to my blood and cure my common cold. It looks like I’ll have to wait. The challenge with farming, I learn, is that you work and you toil and you labor – and then you wait. Waiting, I’m used to. I feel like, lately, I’m always waiting. Waiting for the E train to arrive at the West 4th Street Station so I can head out to Queens to visit my family. Waiting on the checkout line at the Gourmet Garage so I can rush home to bake a flourless chocolate cake or cook up a rib eye steak. Even waiting for love to arrive around the next corner. Waiting — I’m getting good at. And now, I find myself waiting for blades of grass to grow. But will all this waiting be worth it? 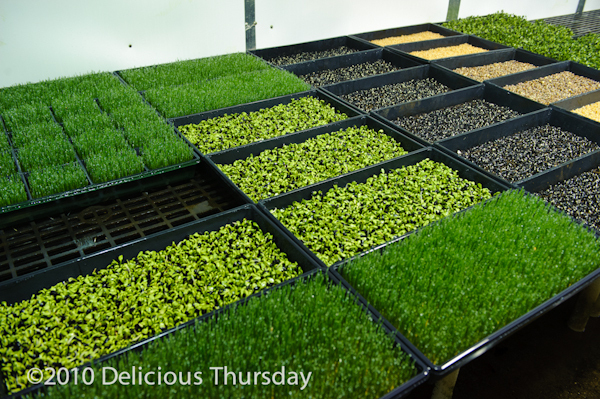 We load the wheatgrass trays into a room where misting water gently coaxes the grass to grow. 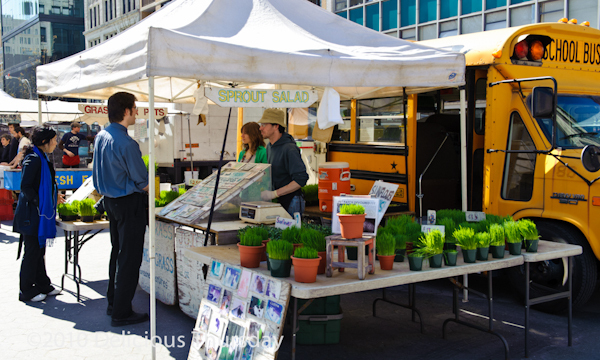 This is a true urban farm: no greenery in the ground – just tabletop growing at its best. 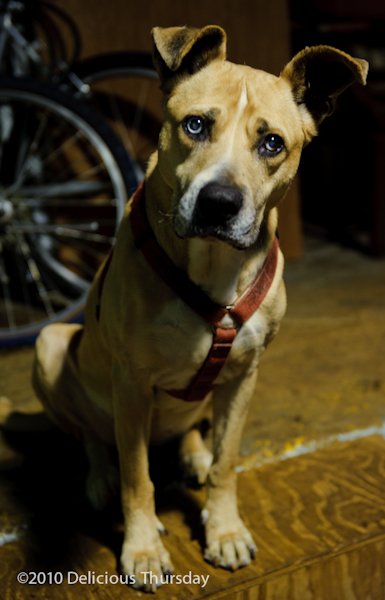 The space is an eclectic mix & match of parts much like my canine friends (Sam is a lab/chow and Sascha a pit/husky). The floors are a grey cement, the walls are brick with a messy mortar stacked in between and the garage doors are a moody blue. The space is dark and shady and filled with soil and dirt. The only brightness comes from Stewart’s quirky smile and the shiny green blades of grass starting to peek their way out of the soil. I’ve got 6 more days to go before I see the full fruits of my labor. 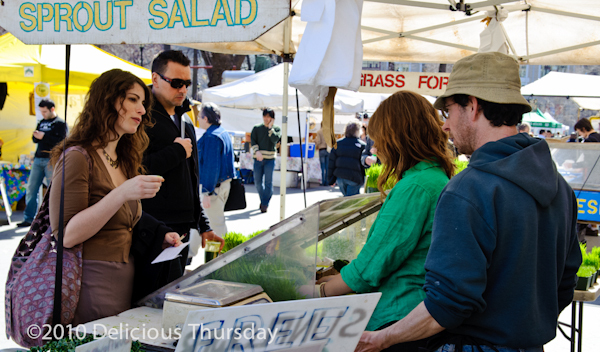 But once the grass has grown, will the juice from these crops be a cure-all? Will the waiting be worth it? I must admit, I am a little skeptical. An old coffin factory in the Gowanus section of Brooklyn is an unlikely place to perform lifesaving acts. 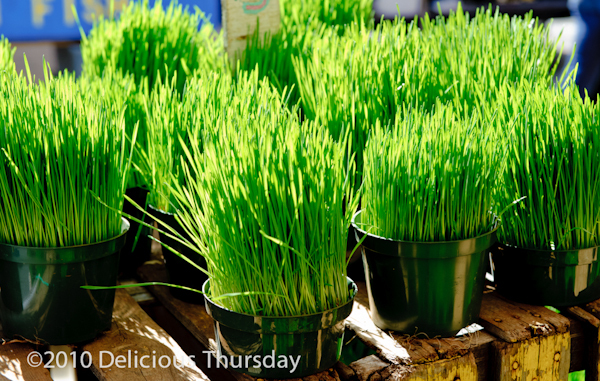 Wheatgrass juice is said to have life-altering effects. It has been known to increase red blood-cell count and lower blood pressure. It cleanses the blood, organs and gastrointestinal tract of debris. 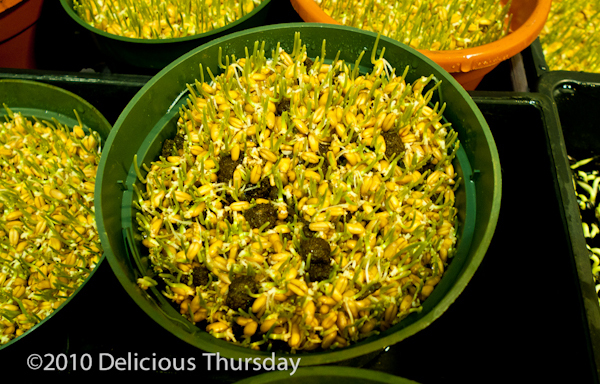 Wheatgrass stimulates metabolism and the thyroid gland, correcting obesity and indigestion. It might even be a cure for cancer. Seems too good to be true. It was time to put the grass to the test. 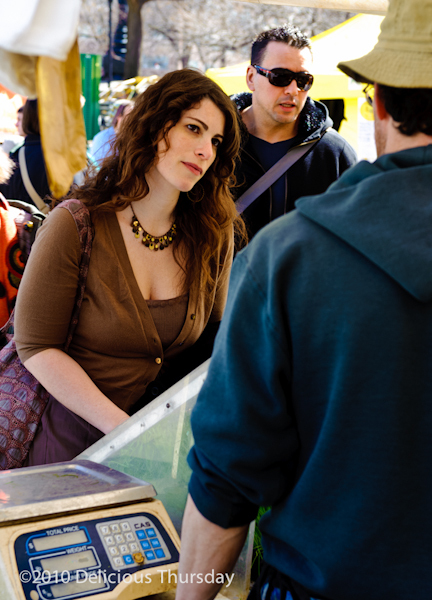 After a week of waiting, I find myself soaking up the early spring at a packed farmers market in Union Square. I wander over to the crowd formed around the yellow school bus just off Union Square West. I make my way to the front of the pack and see Stewart’s smiling face and sinewy frame. A welcome sight. On the table between us are a series of pots of wheatgrass that have grown 6 inches in height and are sparkling in the sunshine. Stewart cuts the grass we grew only one week before. 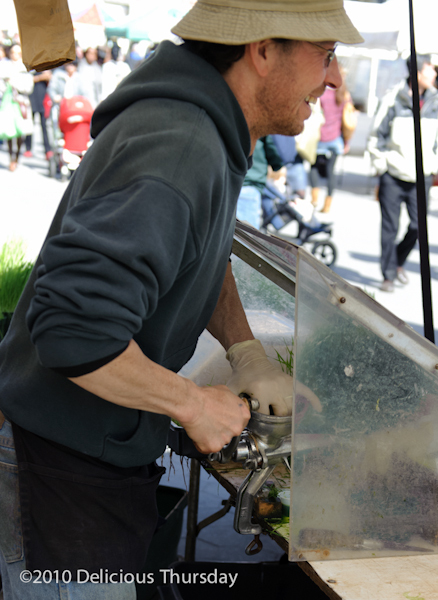 He slowly feeds the blades of wheatgrass into the hand crank juicer. 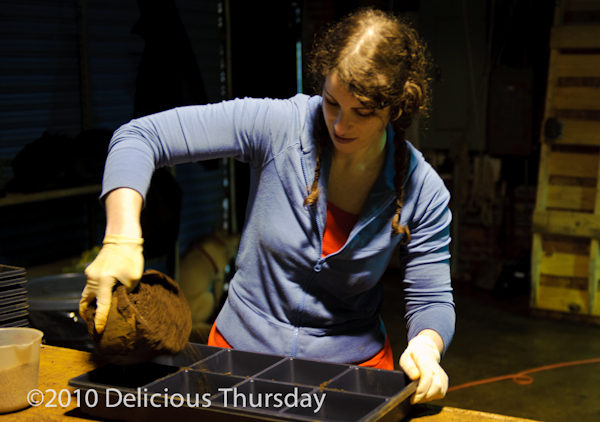 The juice emerges – dark green with a layer of foam on top. I down the shot and hope for the best. The taste is strong and sweet, green and grassy. I don’t know if one glass will be enough to erase those butter filled weeks. A few more glasses of wheatgrass – and time – only that will tell. 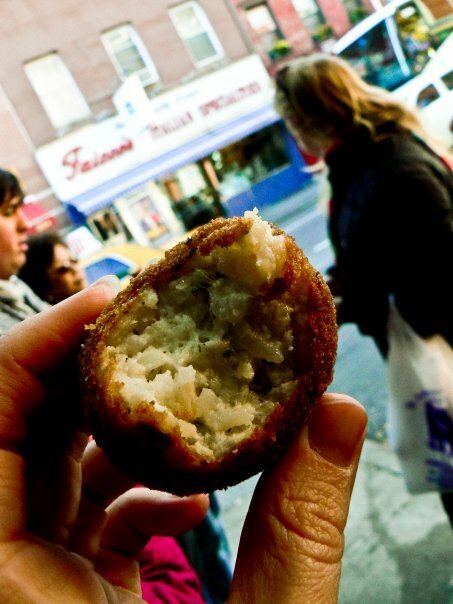 I leave the farmers market and wind my way back to Bleecker. I feel a strange spring in my step — a bit of energy in the air around me. Maybe it’s due to the usually warm weather. Or maybe it’s because I am playing hooky and away from work in the middle of the day. Or maybe – just maybe – it’s the wheatgrass. 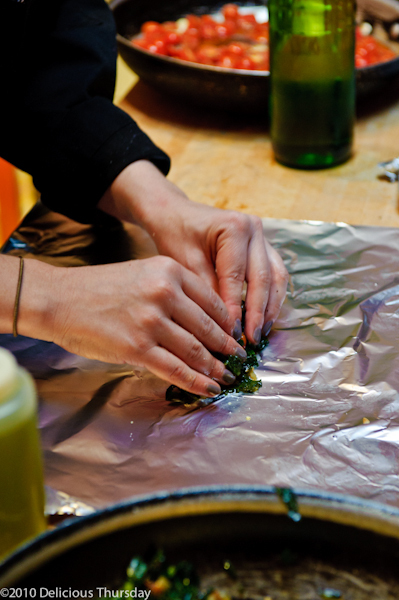 Just the idea of ingesting something so green and so good for me – that alone sets my mind at ease. And maybe that alone is enough. 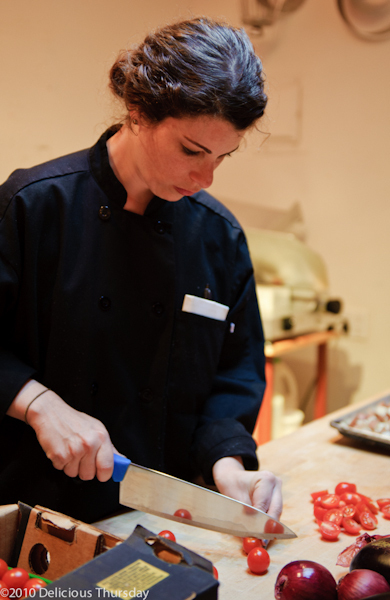 Several weeks of working in NYC’s top kitchens has trained me to pick up my pace, speed up my slicing and spice up my sauces. After a day of planting and a week of waiting I have learned the value of slowing things down a bit. In a city of constant chaos and a culture of instant gratification I realize, there’s really no rush. There are goals to accomplish. There are ladders to climb. There are small successes to accumulate. But there’s no gift in getting there quicker. In fact, I think the opposite is true: Slow and steady wins the race. 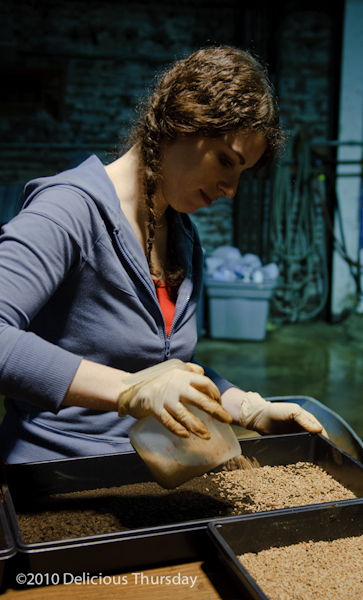 The simple lessons learned from a day of digging in the dirt extend far and wide. Farming is a lesson in patience. A lesson worth learning. Especially when body-healing benefits are the result. The farmer works. The farmer waits. The farmer is rewarded.